Some players are actually good at this game. They eat CPAs for breakfast, exo-waves for lunch, and golems for supper and dessert. I am not one of those players. 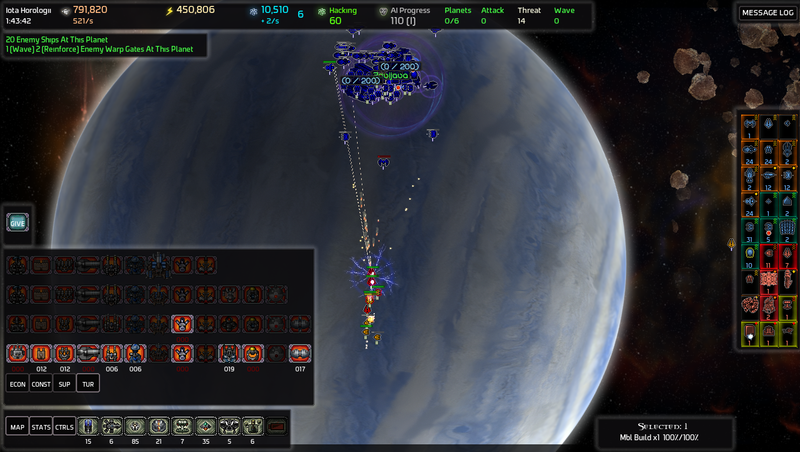 I am incapable of dealing with lone AI starships (as you will soon see). Join me as I blunder my way through a standard rookie game and lead the human race to extinction! ...wow that minor faction list is surprisingly empty without any of the expansions turned on. No minor factions. No modifiers. No AI plots. No gimmicks. Just me versus the machine. 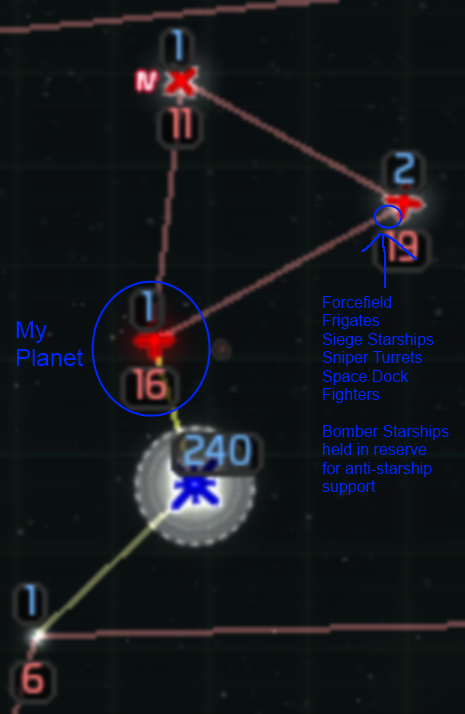 The game wants to give me microfighters at my starting location. Whatever. I'll roll with it. It was a dark and stormy night. I couldn't quite understand how it was dark and stormy, or even how it could be night time, because space isn't supposed to work that way dangit! But there I was. All alone, inside a space station, with the only things to keep me occupied being a refrigerator, a computer screen, some space factories, and a whole lot of angry robots. 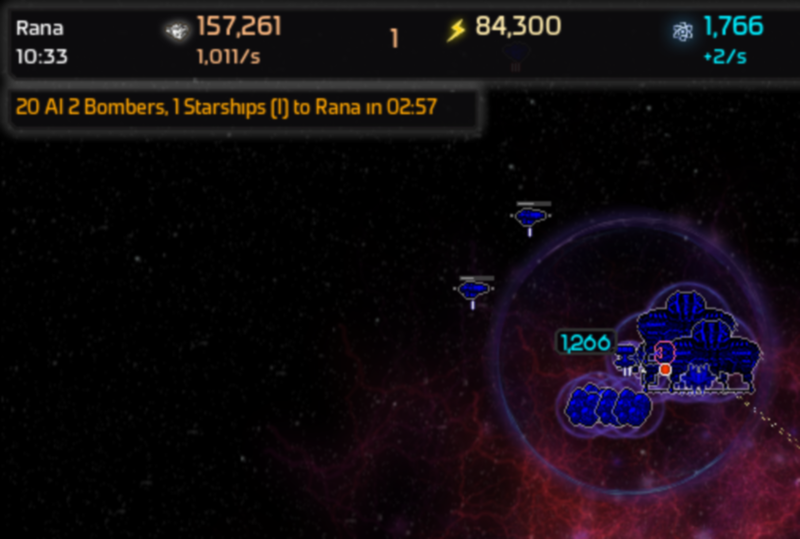 This is the Rana star system. I live here. It is my home. If the robots want it then they will have to take it from me. 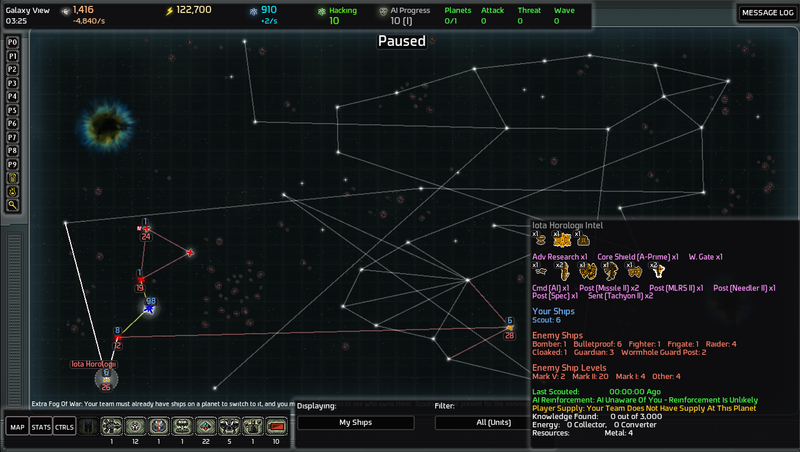 Alrighty, first thing I do is spend 9,500 of my 10,000 starting science on MKIII metal harvesters and MKII scouts. MKII scouts are a must for anything remotely resembling actual scouting, and there is no such thing as too much metal. Fighters – These are good at getting themselves killed. MicroFighters – Exactly like normal fighters, only more cute. Also something about tachylon beams. 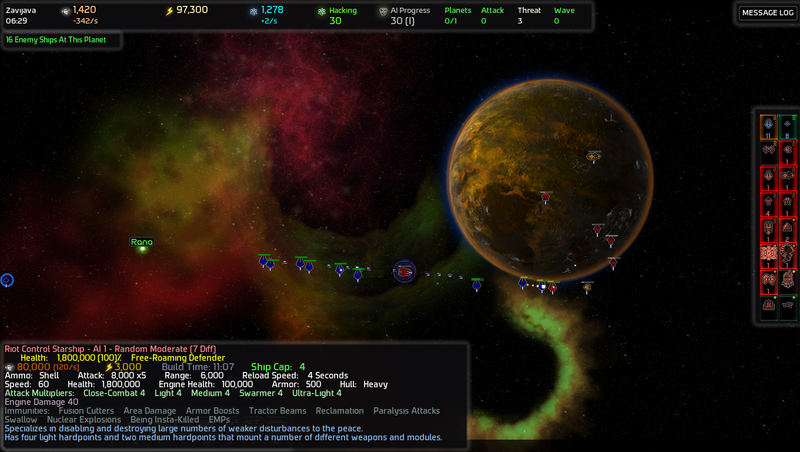 Bombers – These are good at killing my homeworld defenses. Scouts – These are bad at surviving long-distance road trips. Frigates – I have no idea how to use these effectively. 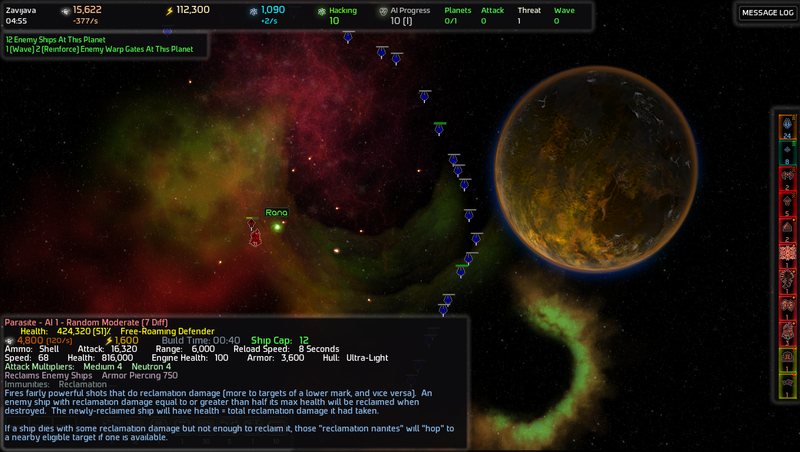 Flagships – Provides an attack bonus to nearby fleetships. They also refuse to stay with the group if auto-kiting is enabled. 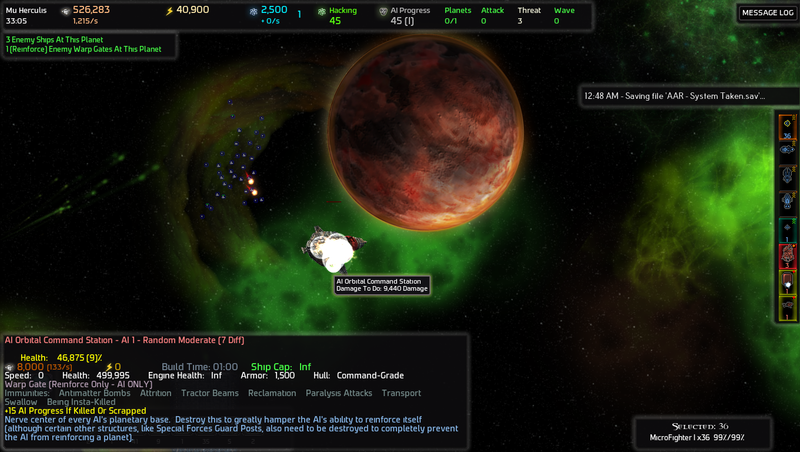 Raid Starships – These are too fragile to use for actual raiding. 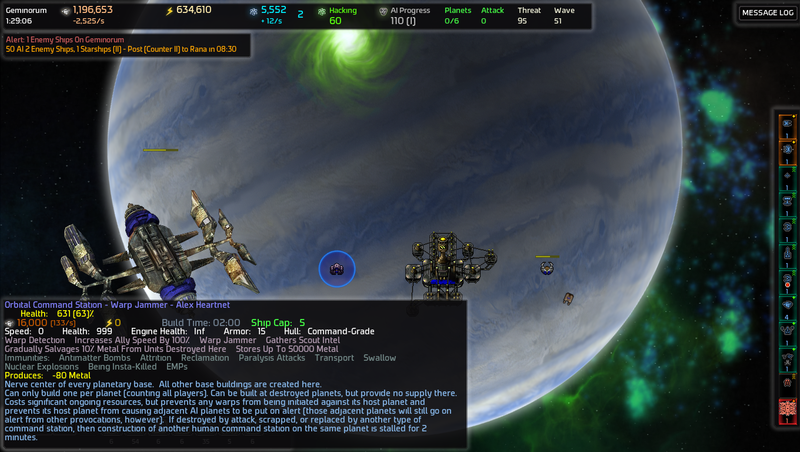 Leech Starships – These steal enemy ships, resulting in me having uneven fleet numbers. I don't like uneven fleet numbers, therefore I won't use them. 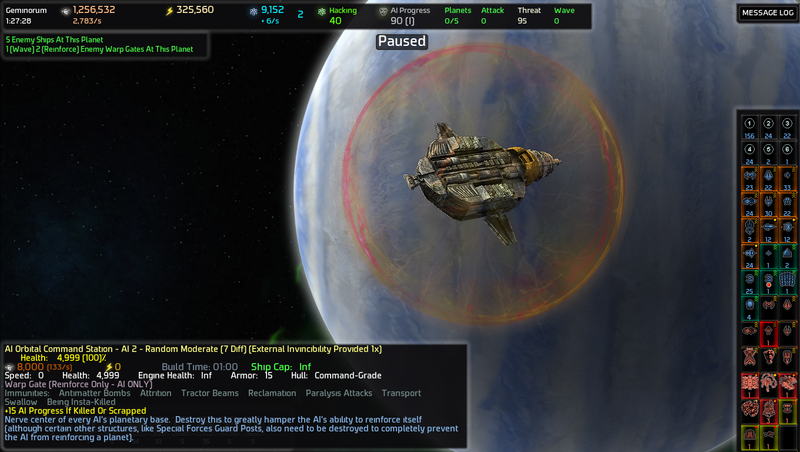 Heavy Bomber Starships – Like normal bombers, only bigger? 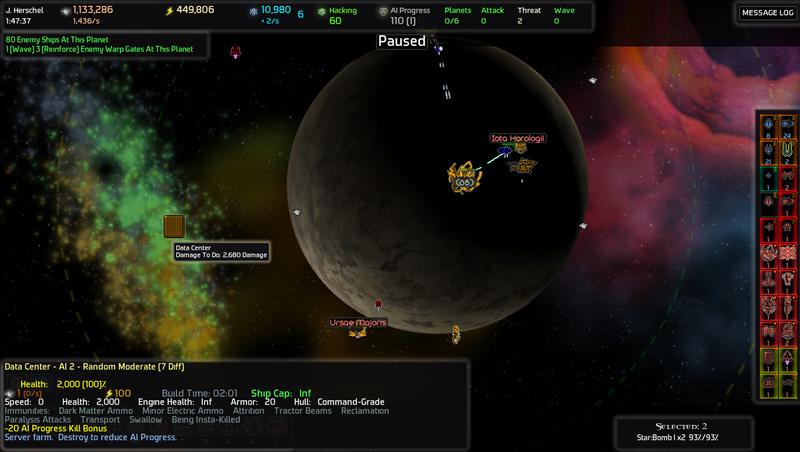 Scout Starships – Just like normal ones, only more expensive to replace. Let's start by setting one of the space docks to auto-manufacture MKI and MKII scouts, then by building ten of each Basic, Missile, Laser, MLRS, and Tractor Turrets. Here we have a map of the galaxy. Fortunately, I have a plan! It shall survive contact with the enemy and lead me to final victory! Yep, nothing can possibly go wrong. Nothing at all. This system is controlled by AI 1, AKA "Starnet" Apparently it was first made by the Cylons because they needed help fighting the Kirathi Empire in some bizarre cross-continuity war, but Starnet instead joined forces with Skynet and wiped out both kitty and toaster alike, leaving behind a huge galaxy-sized mess for me to clean up. Thanks guys. 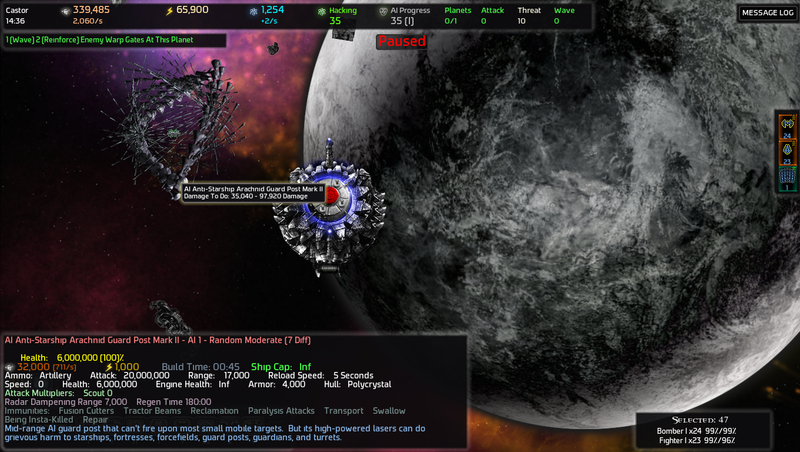 My first move in this extragalactic 9d chess game is to run my economy into the ground by building too many turrets at once send out some automated scouts to find stuff. 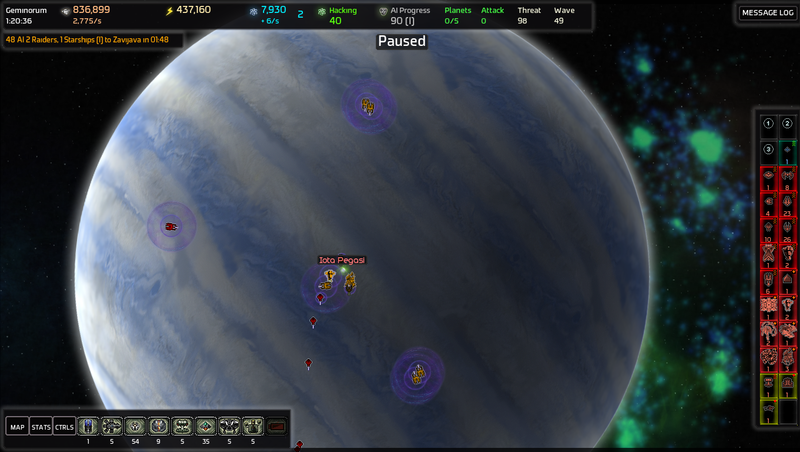 I gave them general orders to place a sentry at each and every system before moving on. They sent me data for a while, but then suddenly stopped broadcasting entirely. How odd. I wonder what happened to them. At least they found some interesting stuff out there. Space Planes are those thingies with the tractor beams on them, correct? I REALLY don't want the AI to have those, I'll have to wait until I have some hacking points before doing anything in this system. Parasites, meh. Hate those things. If I won't use them them then the AI can't either. Well, guess I'l have to take and hold this system. Space. Tanks. Tanks. In SPACE. I. Want. And last but not least, an ARS. 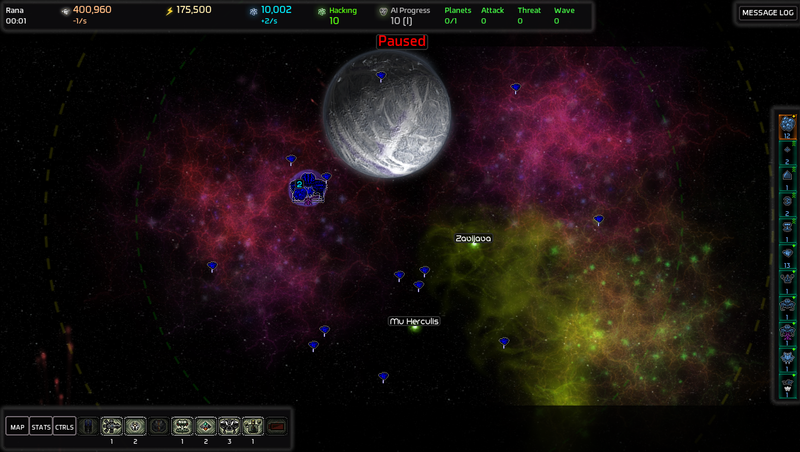 All of this, in the three-planet cluster behind my homeworld. Good deal! 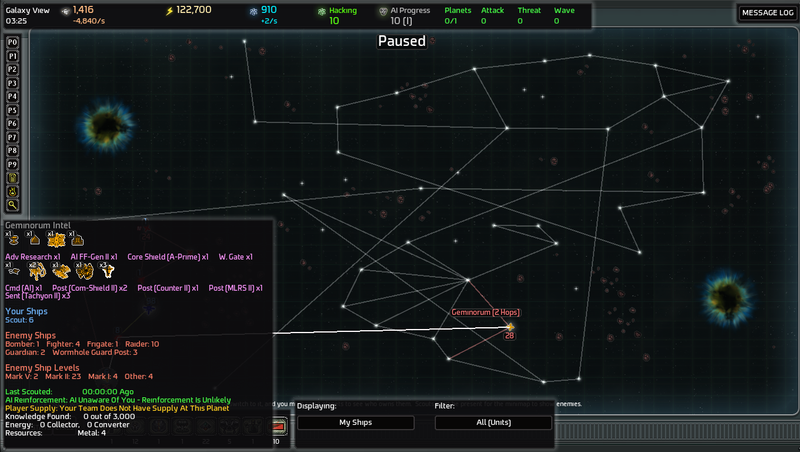 Also, my scouts seem to be complaining about ion cannons. Shut up and be a man about it, you puny weaklings. Wow. 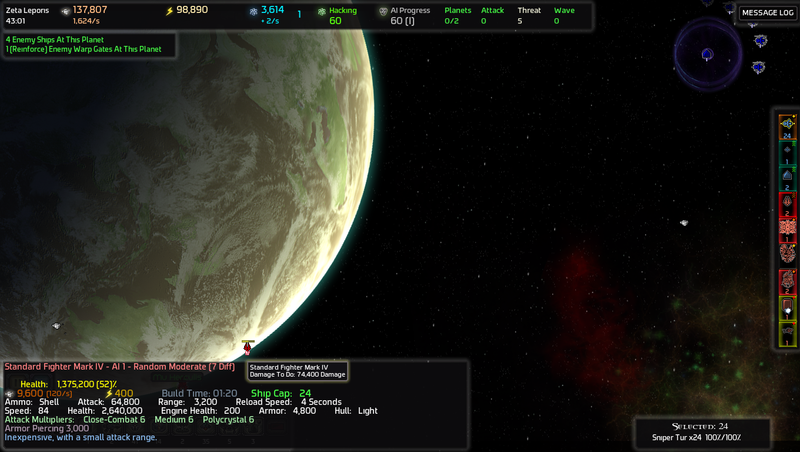 So many nice things to be had so close to my homeworld! I think I like this galaxy. ...Unfortunately, I don't have enough hacking points to get it all. Time to earn some. 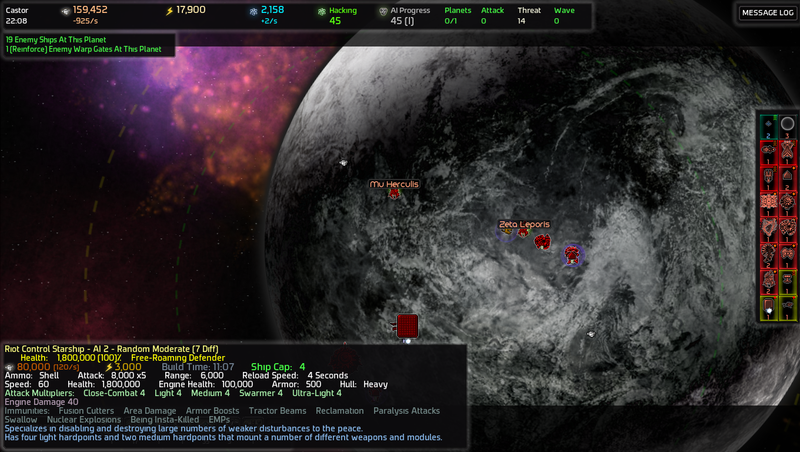 Zavijava doesn't have anything of significance, so blowing up the command station there will be a good start. 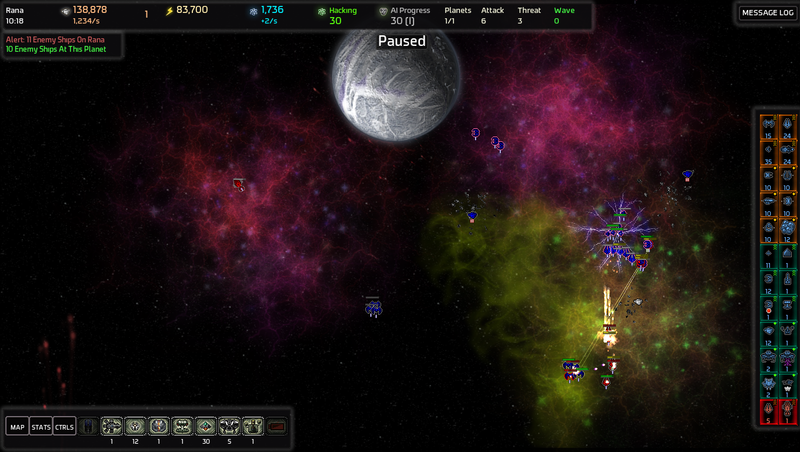 I don't yet have the resources for a full cap of every ship, so I'll make do with fighters for now. The assault start out well. 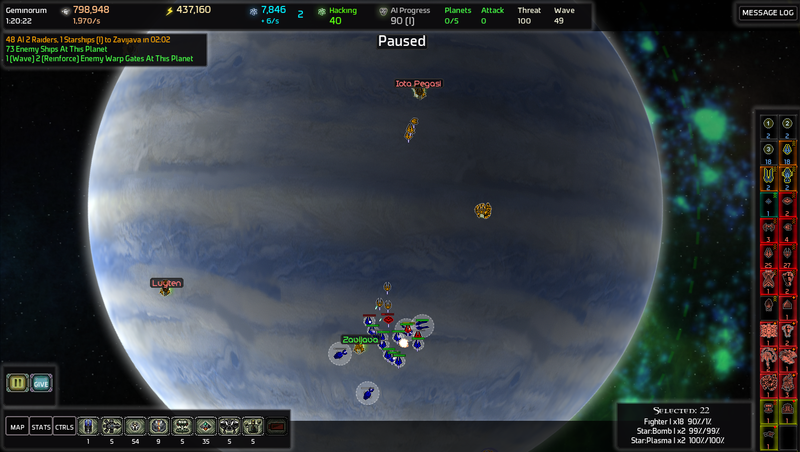 My fighters swiftly deal with the lone parasite guarding the wormhole. 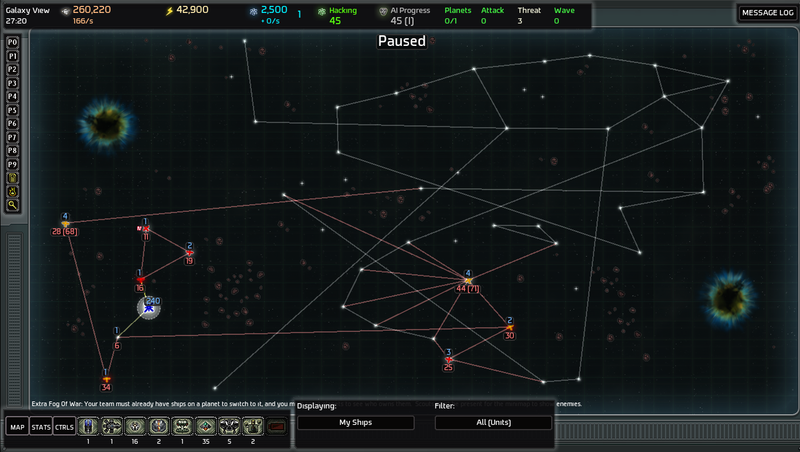 Apparently Starnet has force fields around its guard posts. I don't have the firepower to deal with those quite yet, so I'll leave those alone for now. 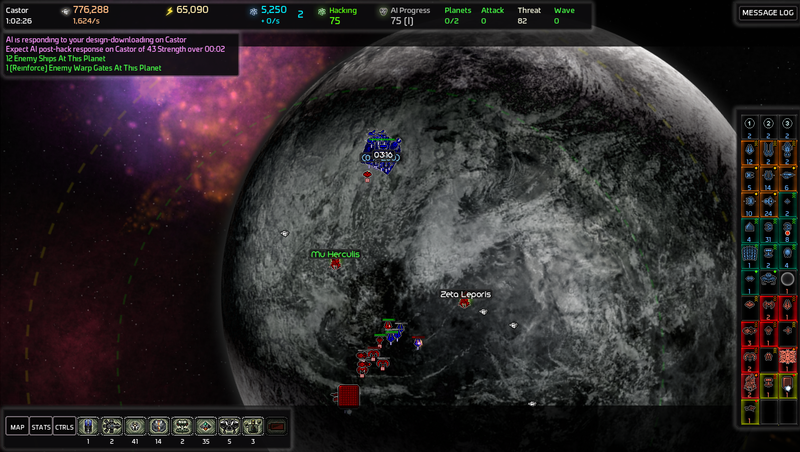 The orbital command station, on the other hand, is completely undefended. Blowing it up will net me +20 AIP Hacking Points. Those space tanks are mine already! I'd love to press the attack, but my little assassination seems to of woken up the guards. 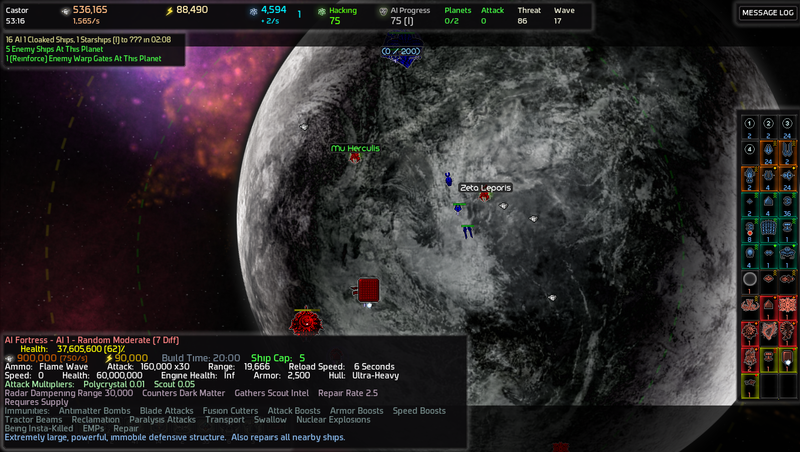 Already I have a bulletproof fighter peppering my fleet and oh hello mister Riot Starship how are you today? 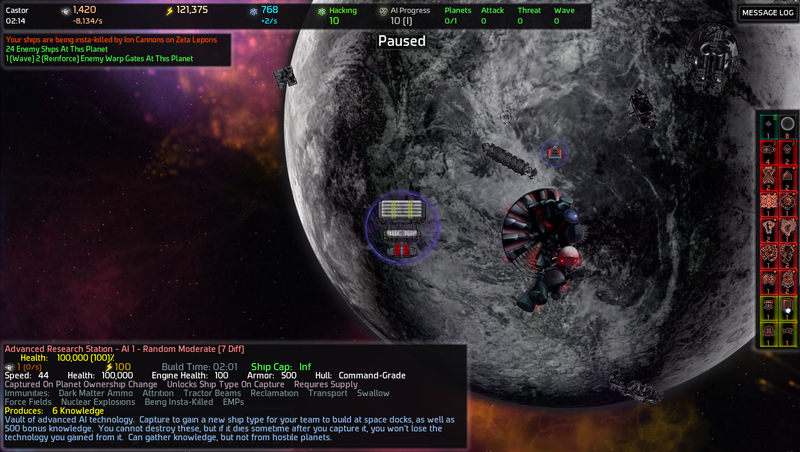 You know how riot starship weapons disable engines? With the very low unit cap I am using, the engine damage that would instead by spread out among hundreds of ships is instead concentrated at a handful of them. ...Yeah. Know what? My ships are as good as dead anyway, might as well just scrap them. Not 10 minutes in and already I have had a fleet wipe. Sigh. Actually, Space Planes are light, fast, high cap cloaked ships. 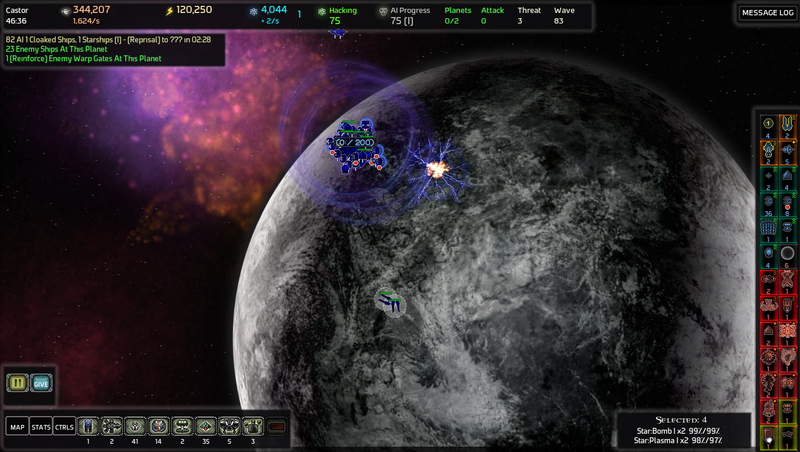 They also have amazing Radar Dampening--less than their attack range--which the AI doesn't make great use of. I wouldn't worry too much about them in the AI's hands. Etherjets are the ones that have Tractor Beams. Those can be...interesting...to deal with. Good news! 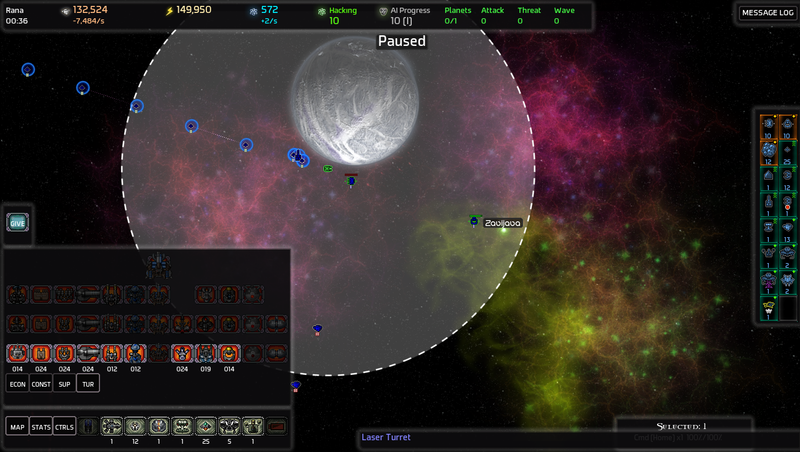 I am almost at my full cap of fleet ships! Bad news. Starnet went and announced that it was going to send some ships to murder me. But good news! Just about all of my defenses are now online! I am now safe from any and all attacks from the Zavljava system. 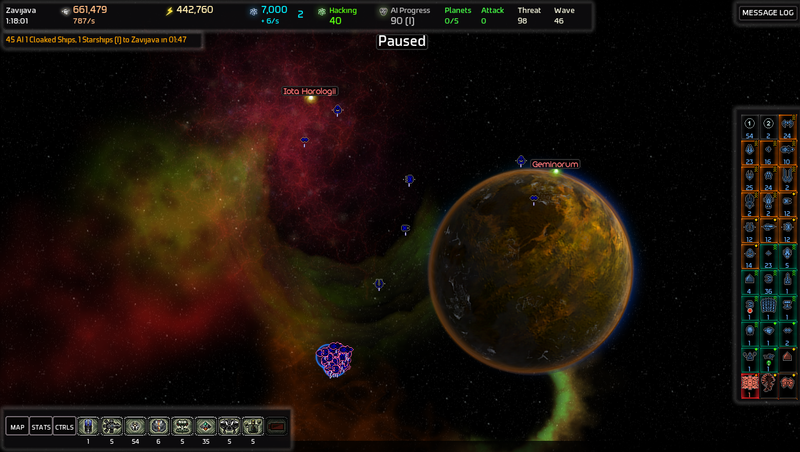 And since I plan on taking the cluster behind my homeworld, I won't have to set up defenses along there. Not even a third a cap of fighters? Hah! Not worried at all. 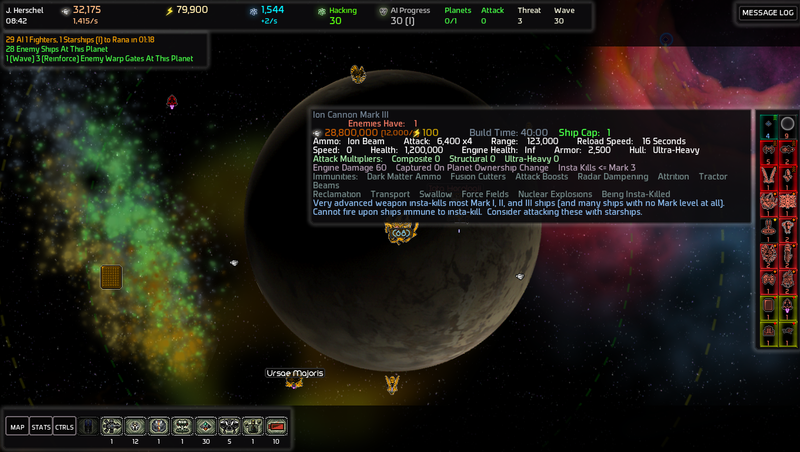 New scout intel just came in and wow yet more loot so close to my homeworld. Seriously. Just wow. The attack wave hits. 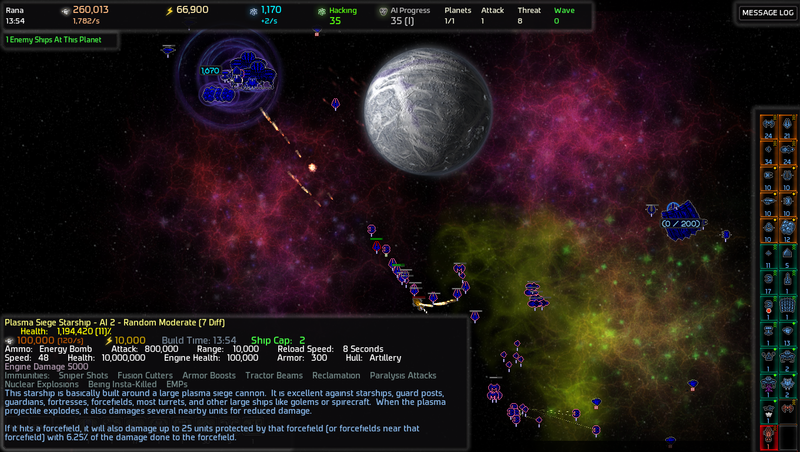 Know how all my defenses are aimed at the Zavljava system? I had ALL of my ships parked right on top of the wormhole anticipation of the attack but didn't think to take a screenshot of it. 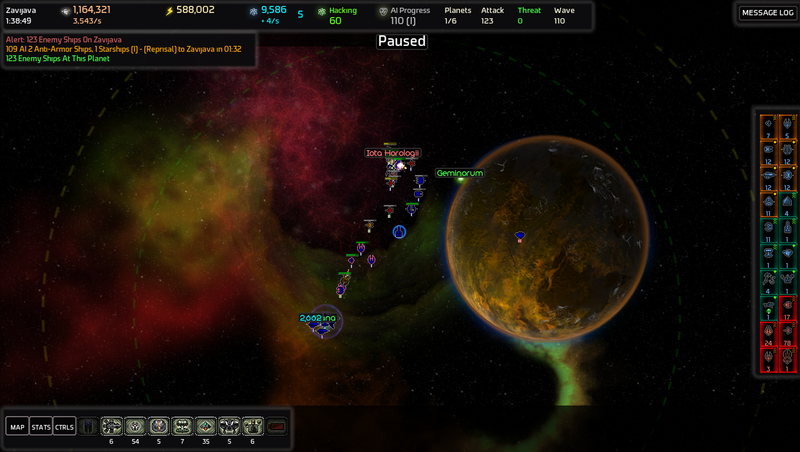 Take a guess which wormhole the attack came from, and where I had my fleet parked. 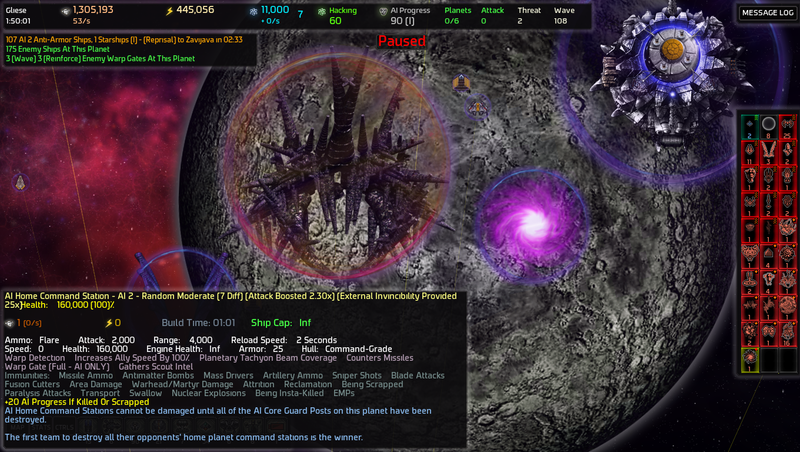 Also that's a plasma siege starship. While my frigates and fighters FRD the enemy fleetships I'll just order my bombers to attack the starship while grouped together in one big cluster. This results in all the bombers getting hit with a single energy bomb. 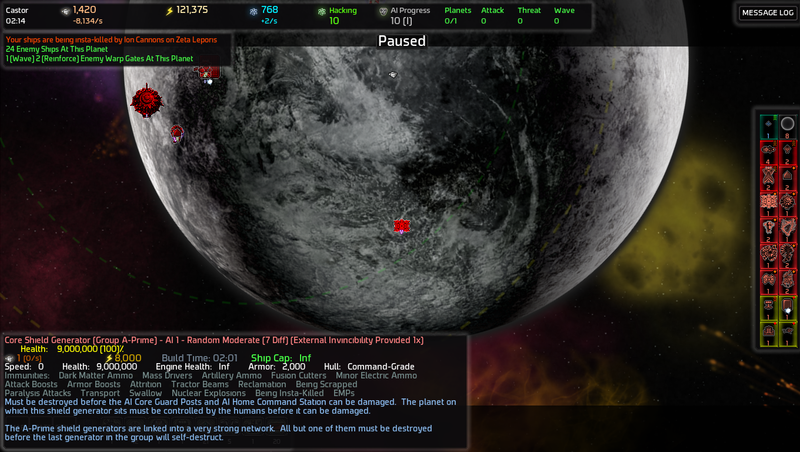 Engine damage = bombers no longer moving = nothing left to stop the starship = bad. 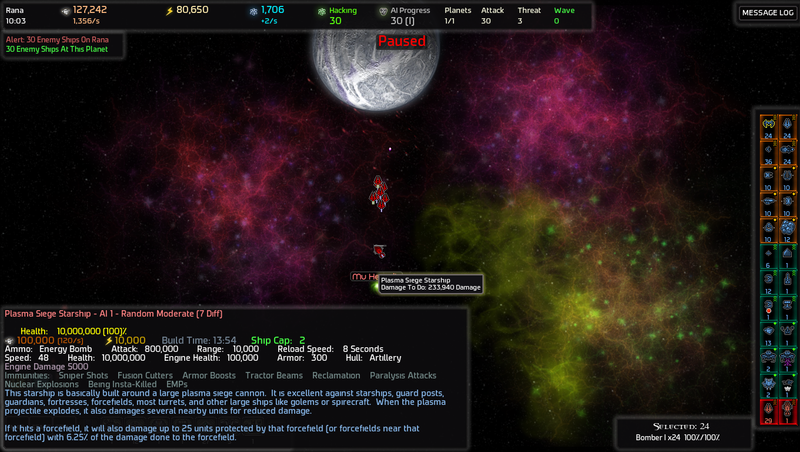 My fighters finish off the enemy fleetships, only to get energy bomb'd as well. And siege starships are faster then frigates. Thankfully a combination of MRLS Turret and Missile Turret fire is enough to destroy it. Blargh. 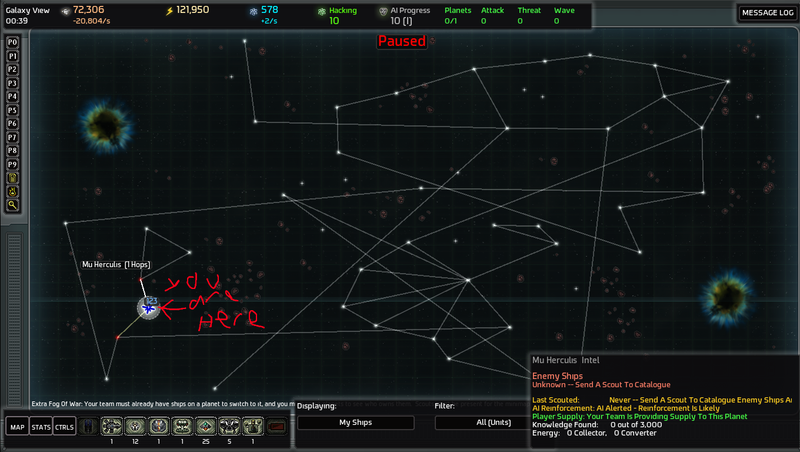 Well, there's not much sense in just waiting around for Starnet to send ship after ship after ship at me. I need a bit of time to think about where I want to spend my hacking points plus I may or may not of pre-recorded this segment beforehand, so I'll spend my remaining research points on something and then go gate-raiding for more AIP. 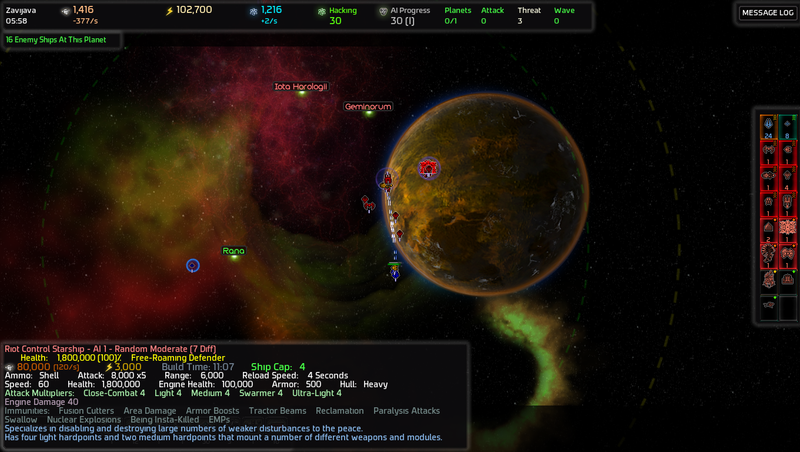 I plan on taking all the systems behind my homeworld anyway, so no harm done. 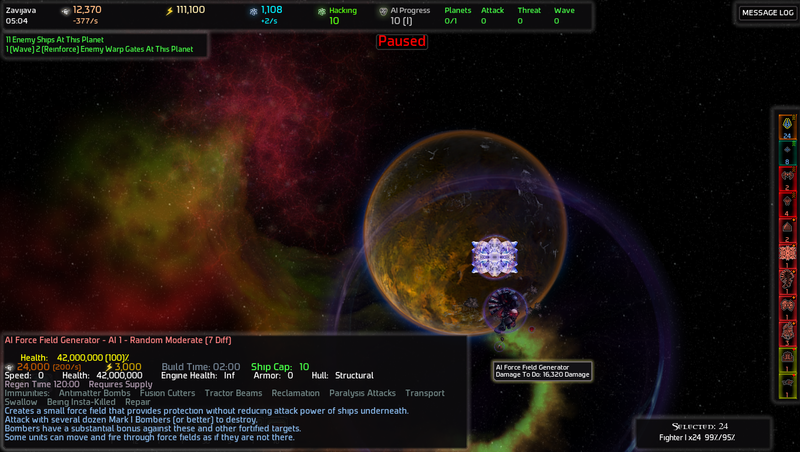 Hardened Force Fields? When did this get added? How are these better/worse then normal ones? 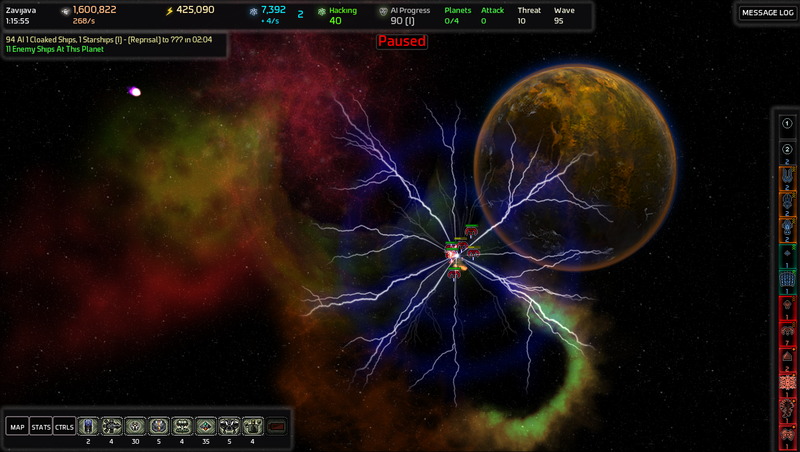 Eh, more force fields I guess. 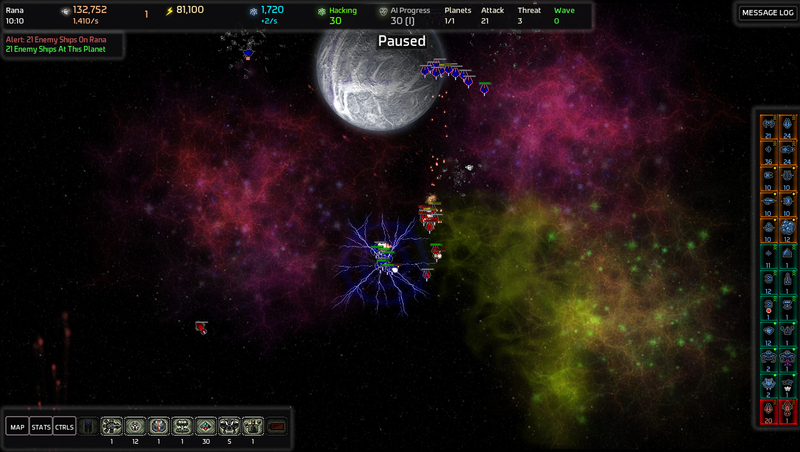 Force fields are like bullets – there is no such thing as too many of them. I'll start by building a transport and load my fighters and bombers in. 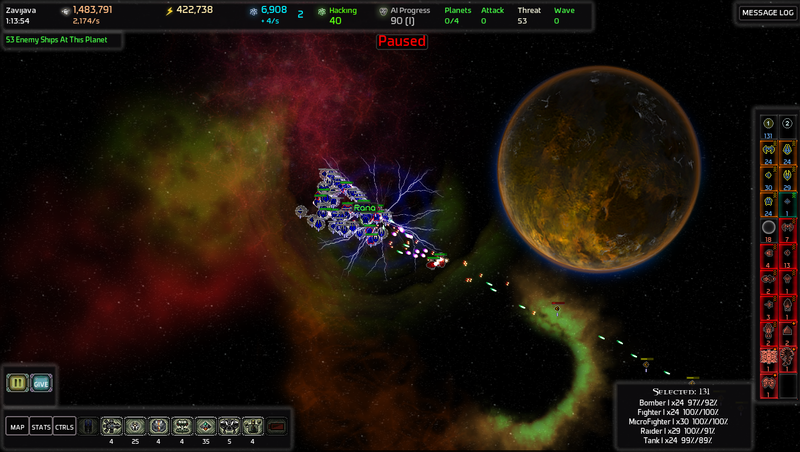 My microfighters and frigates should be able to hold the line when the second wave hits. Mu Herculis seems like a good place to start. Pop! Next stop is Zeta Lepons, which is a MKIV system. My transport 'only' loses 33% of its health due to leaving supply, but then gets shot at and goes from 64% health to 20% health in three seconds! Abandon ship! Looking through the screenshots, it's unclear exactly what I was trying to do...looks like I tried to attack a MKIV MLRS Guard Post with my fighters and bombers? Apparently I ended up ordering a retreat instead. Back in the Mu Herculis system, my retreating fleet gets torn apart by two space planes, three parasites, and one MKIV fighter. I order my fighters to hang back and buy time for the bombers to escape. 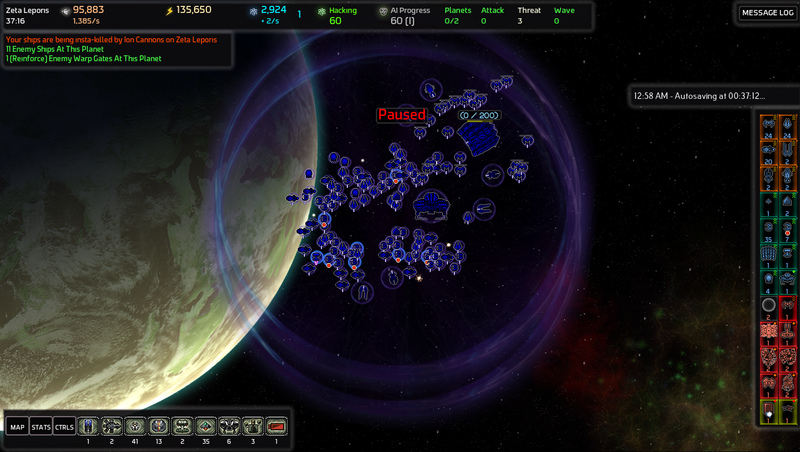 My retreating fleet arrives home a moment after the attack wave hits. This places my ships in two groups instead of one, meaning that they don't all get hit at the same time by a single plasma bomb, and thus things go smoother this time. ...Skynet had basically the same wave composition as Starnet did at nearly the same AIP - 1 plasma siege and ~20 fleetships. I'm starting to think they might both be Mad Bombers. What do you guys think? Got a new transport this time. Loading up! 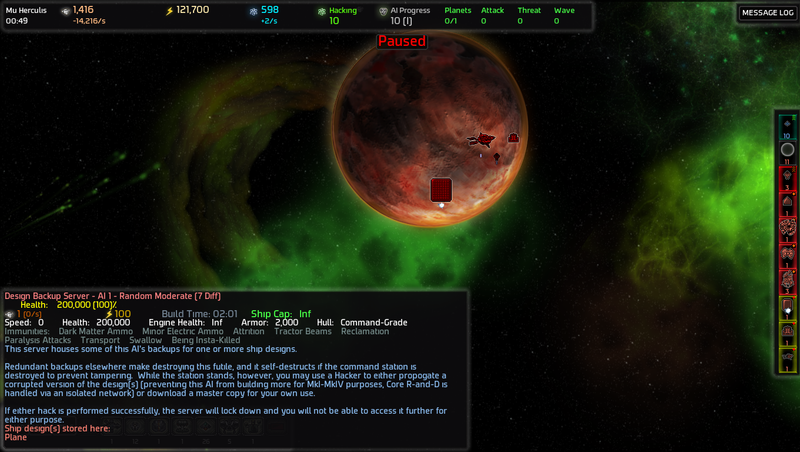 And umm that's a fortress AND an anti-starship guard post over in Castor. I'll...avoid those for now. Ahahahahhaa now how are you going to attack me? Send your waves cross-planet? My old friend the Riot Control Starship chases my ships out of the Castor system. In other news, I just ordered a pair of bomber starships. That thing is so dead next time we meet. 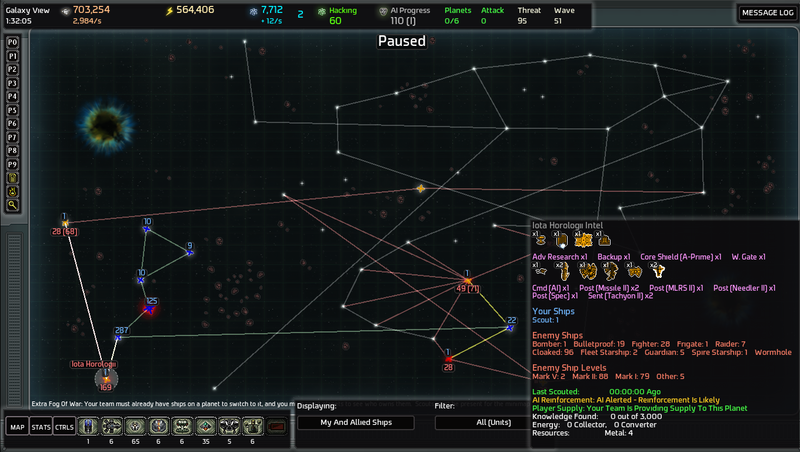 ...Umm, why are there suddenly numbers over all my ships? Oh, low power, right. 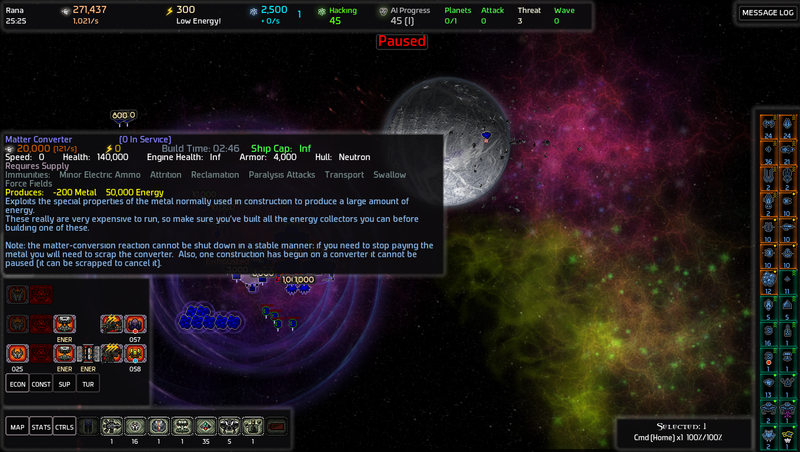 I'll just set my new starships to low-power mode, since I don't need them quite yet. ...That doesn't work anymore? Fine I'll build one of those newfangled matter converters instead. Back in my day we could build not one but THREE power plants in each system! ...Hmm. Time to build a hacker, a colony ship, a mobile builder, a transport, a bunch of engineers, and figure out what I want to do next. 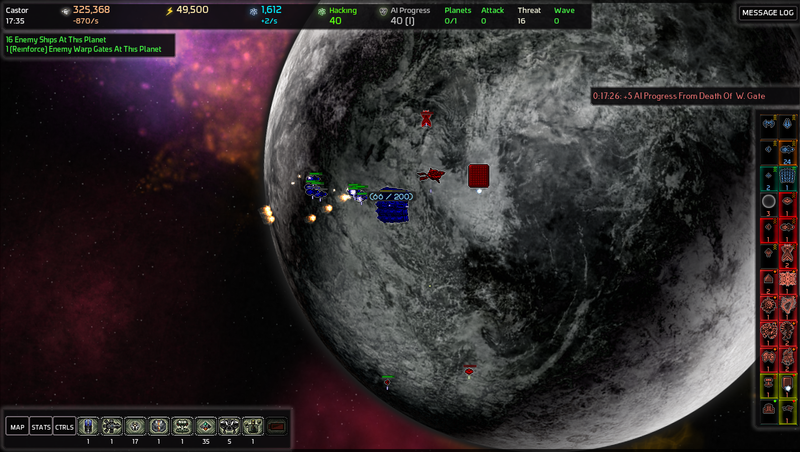 Eh yeah I guess the AI can have its space planes then, especially since I have microfighters. I got it set to Simple units only, so those shouldn't show up. 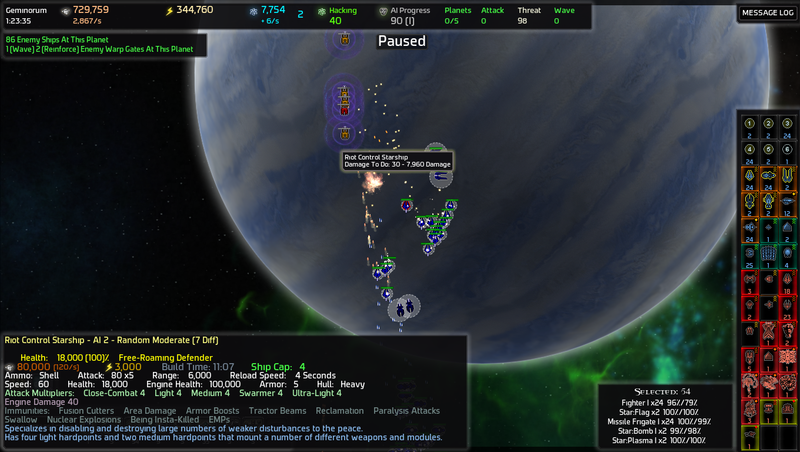 I'll let the AI keep its parasites as well, since if my fleet is wiped ships will get tossed back at me anyway thanks to the salvage mechanic. I still want those space tanks though because tanks in space. As for the ARS, I think I'll shamelessly do some savescumming + hacking to see if I actually want to spend the hacking points on the ARS. Y'know, for science and all. and replace every command station in that mini-cluster with my own. empty for now, since I actually prefer cross-planet waves. As for science purchases, I'll unlock Tractor Turrets II, some other turret II, and hmm. What are mini-forts good for again? I want to try tossing mini-forts at enemies during beachhead situations. Thoughts? The silence is deafining. Even the space crickets are quiet. Whatever. I'll just continue with my current plans of capturing the backwater cluster. 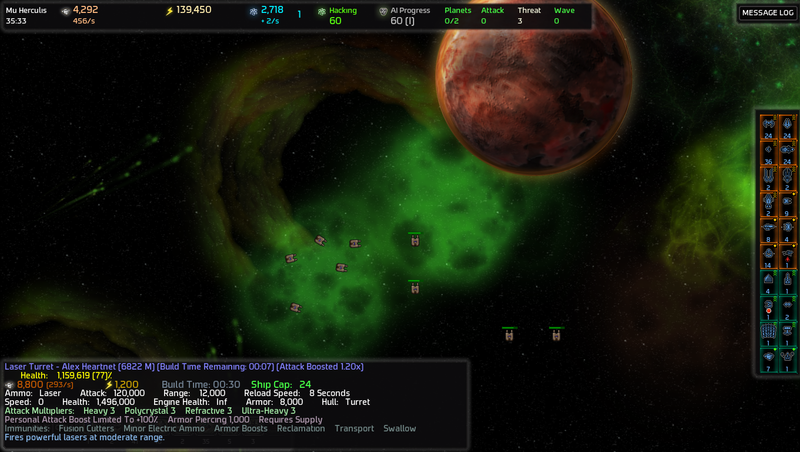 Let's start by replacing the AI command station at Mu Herculis with my own. Pop! 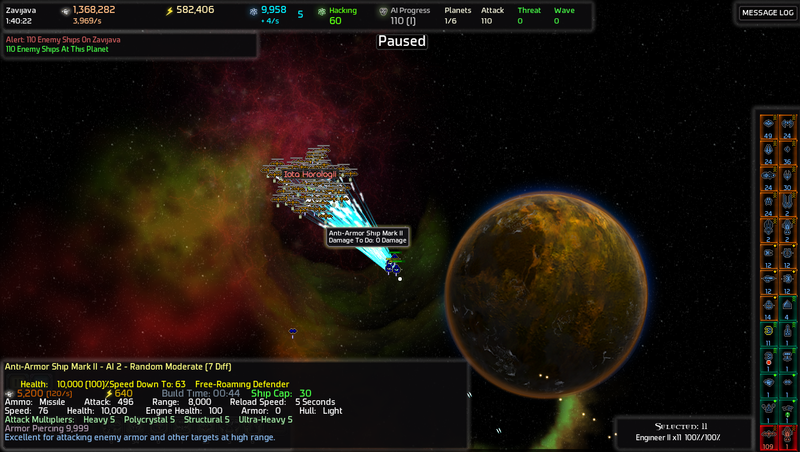 Let's build an excessive amount of defenses (read: more guns then what is protecting my homeworld) to defend against the ships that never actually end up attacking! For a MKIV system, Zeta Lepons is very poorly defensed. 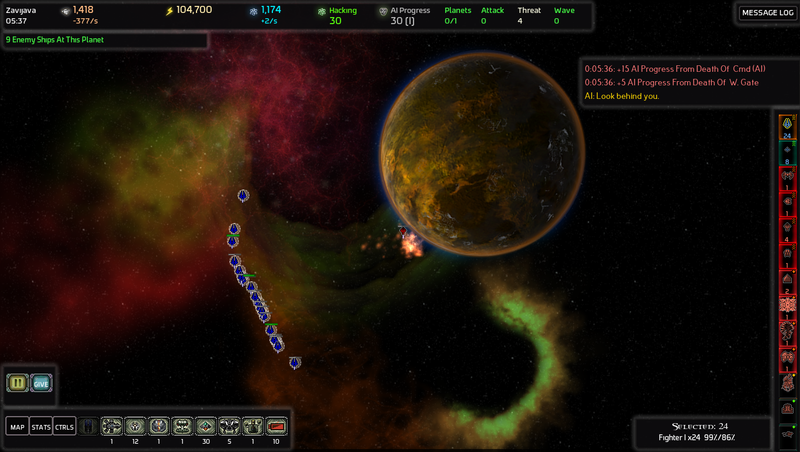 The most notable thing on the planet is the Ion Cannon, which I am going to just destroy instead of capture because it's in my way and I won't need actual defenses for a backwater such as this. There's also the guns on the guard posts, forcefields set up around a couple of the guard posts, a single bomber, and a few riot control starships in a nearby system. 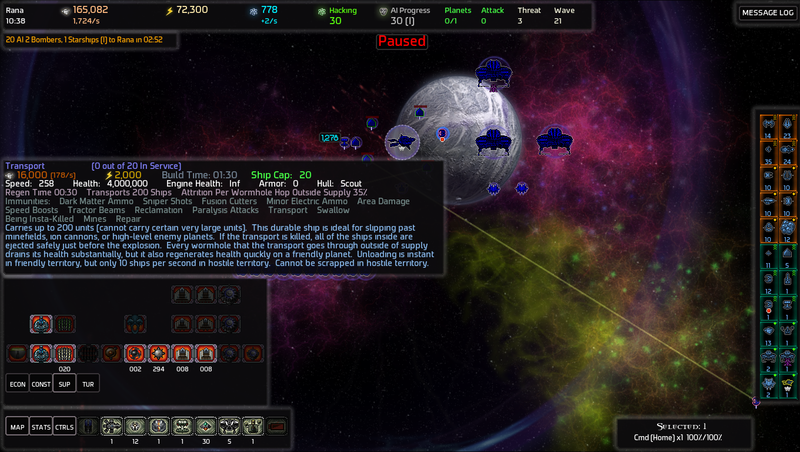 The guard post guns will give me a bit of trouble, but other then that...this is a very lightly defended system! No guardians, no mobile sources of pain, and my bomber starships can easily deal with the odd guardian or riot starship. Time to try out this 'beachheading' tactic proper for the first time in my career. The majority of the beachhead proves to be very redundant. A full cap of sniper turrets rips through the defenses like butter. The guard posts didn't stand a chance. 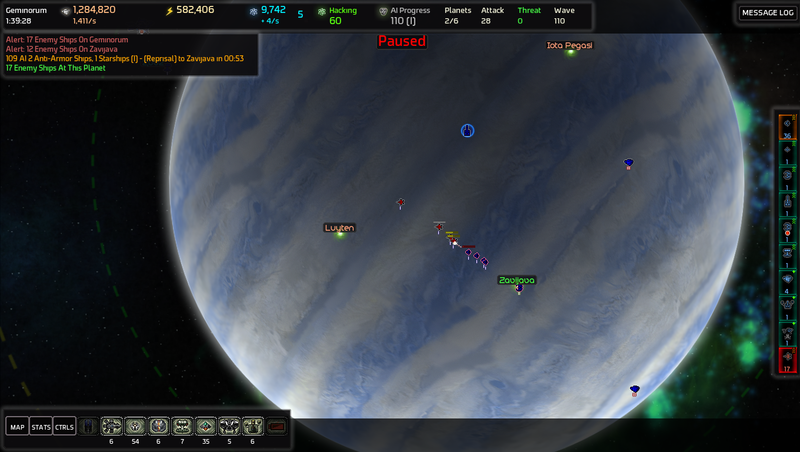 The handful of MKIV fighters sent after me didn't stand a chance either. The battle was over before it began. Command Stations are immune to sniper fire, so I can't just pick it apart with my snipers like I did the rest of the system. 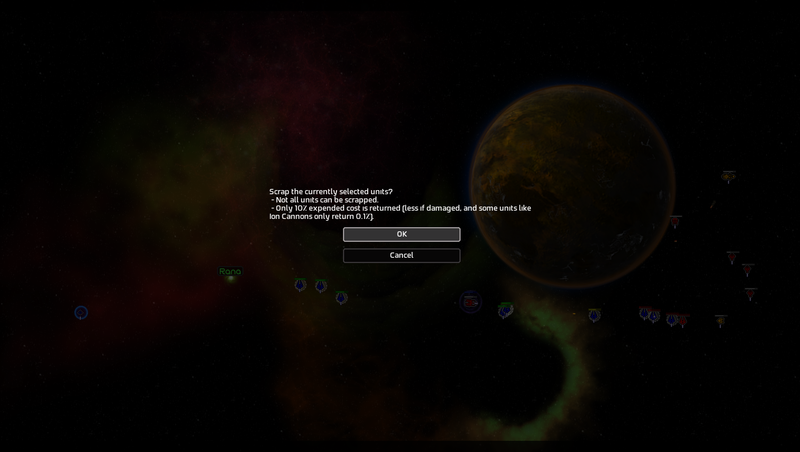 This means I actually have to send ships down to kill it the normal way! Ugh, effort. The beachhead is no longer needed, so I'll just scrap it and move on. 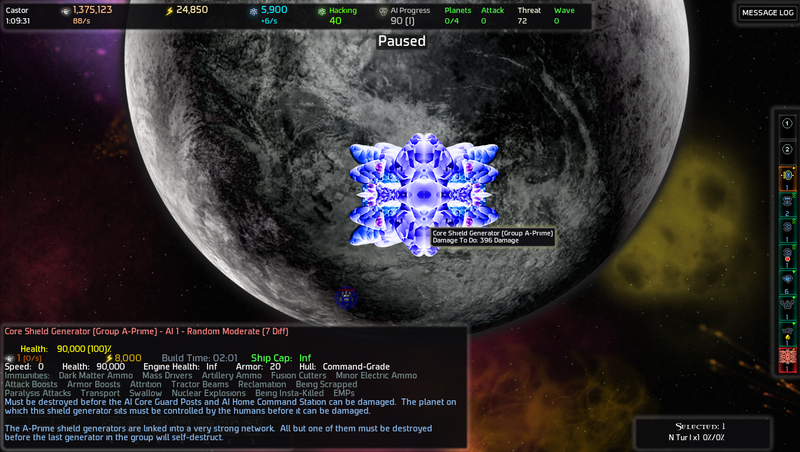 While the AI Command Station is still alive. Oops. Apparently this counts as having my stuff destroyed the normal way. 82 fleet ships?!? 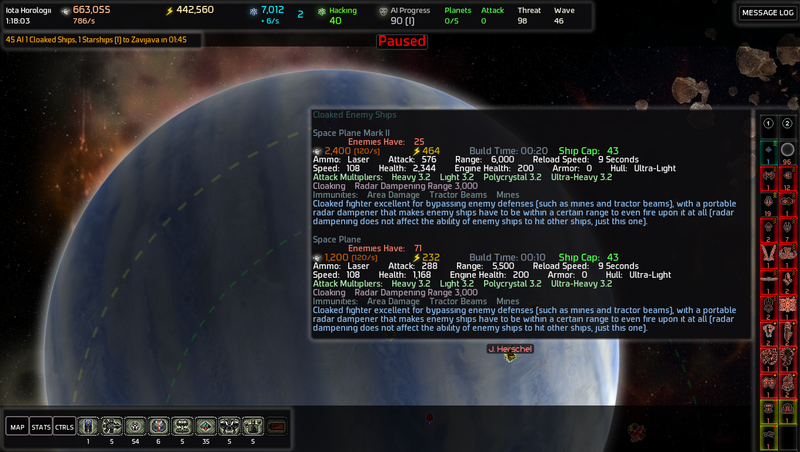 Considering that I am playing with Very Low Unit Caps, and thus that is almost 4x my cap of MKI Fighters, this is a much heavier wave then what I should be fighting at this point in the game. Also lemme guess the starship is another Plasma Siege. 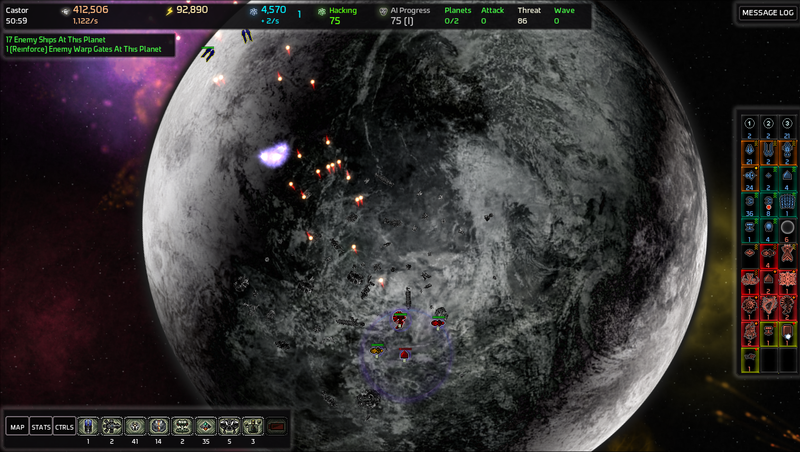 Meanwhile, AI 1's systems are very poorly defended and easy to attack. Both AI's are Mad Bombers. They can't be backdoor hackers or counter-spies because I would of seen those things immediately upon start. Unit composistion isn't right for a feeding parasite, stealth master, or vicious raider. A teleporter turtle won't be sending waves against me at all, attacks from both of them have basically been the same, and the other types aren't valid options for AI picks this game. Welp. At least this means that Starnet won't be able to dislodge my beachhead in the Castor system because the Mad Bomber personality lacks defenses. 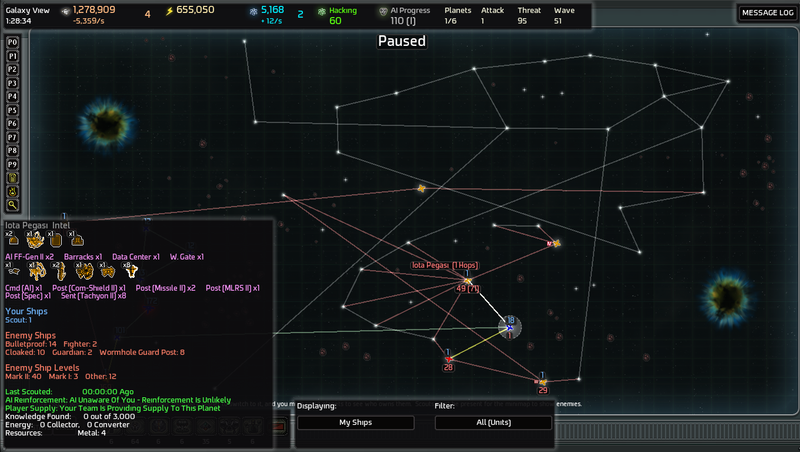 Similar attack plan as before, only I won't use all my fleet ships and instead use my starships. 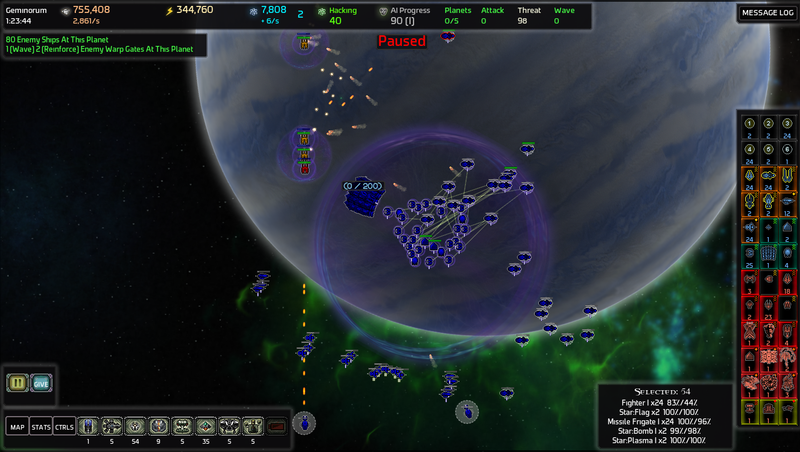 The bomber starships quickly clear out the riot starship and beam guardian, leaving the guard posts defenseless against my attack. I then learn that siege starships are quite squishy, but last a lot longer when a group of fighters are tanking the damage instead. 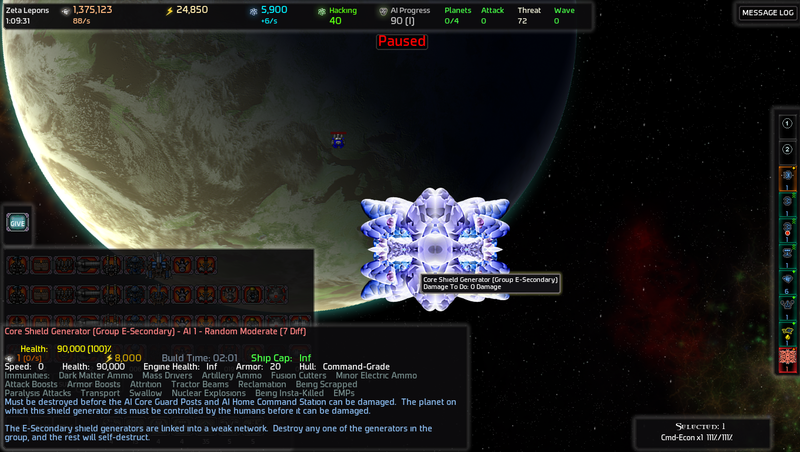 The Fortress proves to be annoying to attack due to its high HP and impressive 0.01% damage modifier against polycrystal hulls, but it eventually falls to a mix of sniper fire and bomber torpedos. 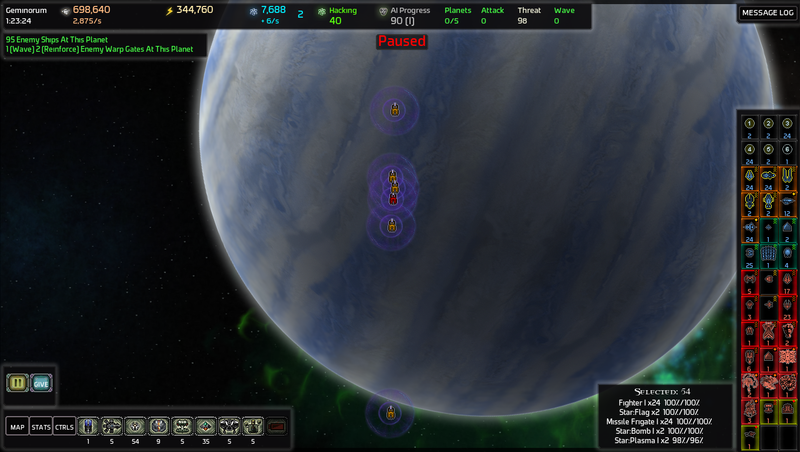 Meanwhile, threat starts to buid up in the Zavijava system from the cross-planet waves. 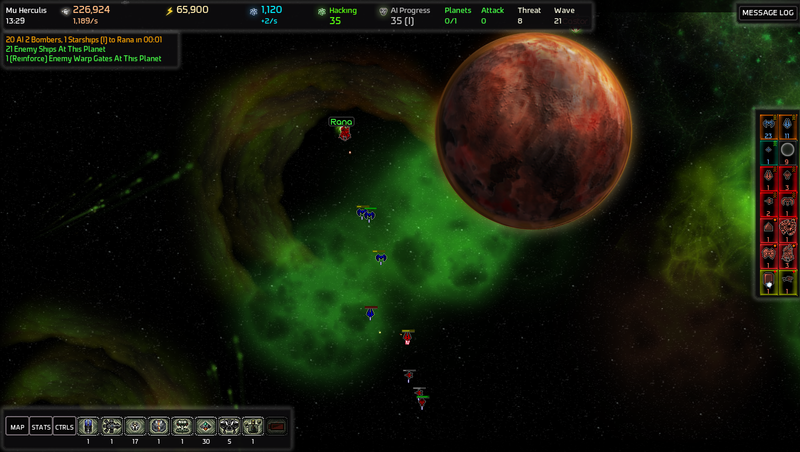 I tried sending in my micro-fighters, but those got murdered without even destorying a single AI ship. 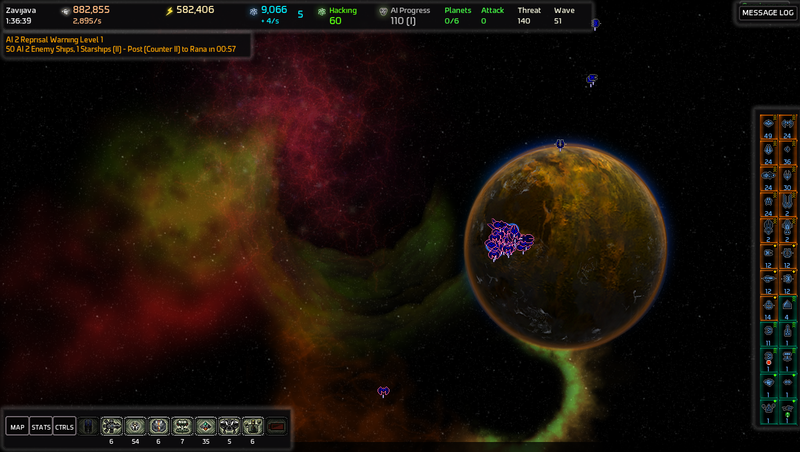 The wave ships seem to be just sitting there, as if they in fact don't want to be vaporised by my homeworld defenses. How strange. Hmm. I wonder what ship class the 16 cloaked ships are? I'm honestly not familiar with basic unit types, having played with complex exotic expansion pack bizarro units for so long. Finally! It is time! Time to do what I cam here for! I'll just use the existing turrets on the existing beachhead and hope nothing goes wrong. After all, it's not like getting overwhelmed and having all those angry robots slamming into my rear flank is much of a problem. Nope, not at all. ...Thankfully, everything goes smoothly and my defenses hold. The mini-cluster is now robot-free! 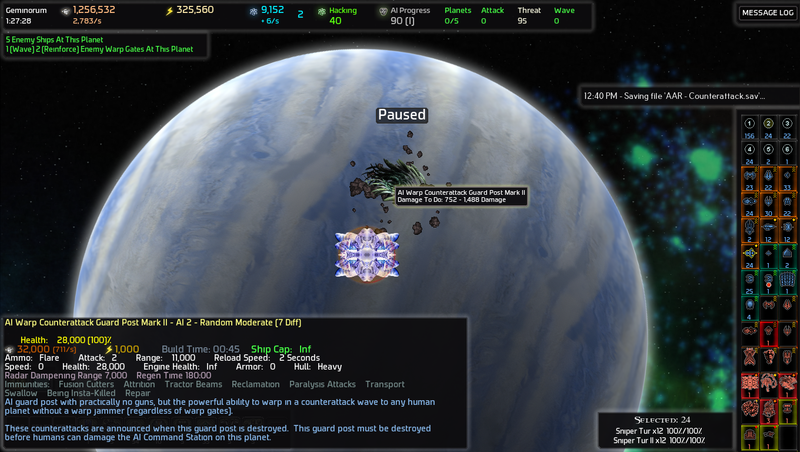 Now I can finally move in, capture the ARS, and start gathering metal and science and redeploy my fleet elsewhere and umm why is the ARS moving towards my new command station? This is new. It better not try to ram me or anything! 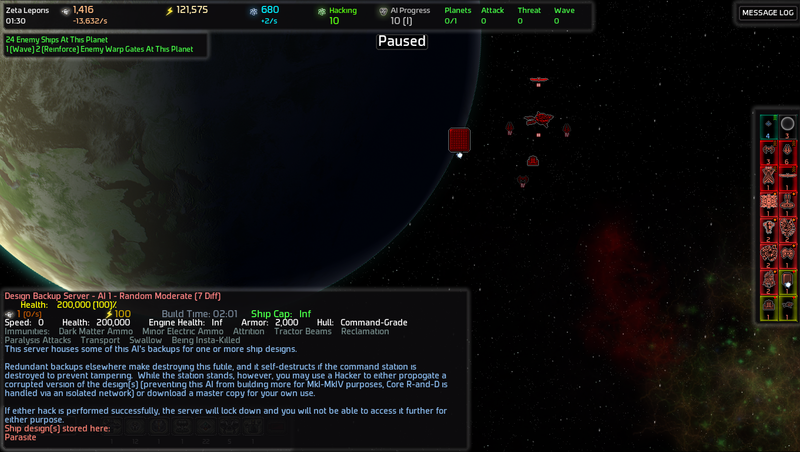 ...Fortunately the ARS merely parks itself right alongside my command station, just waiting to be captured. 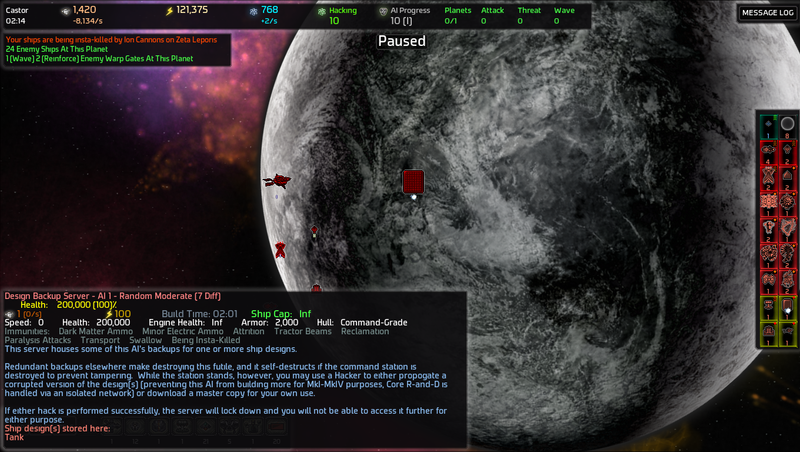 Command station online, planet ownership changes, and the ship blueprints in the ARS becomes mine. ...Raiders? I can honestly say I have not fought with or against these things before. I can easily picture the AI causing havoc with these but I have no idea how to use these myself. The Raider is eponymously designed to make runs at AI guard posts and hound at isolated heavy targets. One might consider them as nimble mid-range Bombers, and use them for effective Guard Post hunting (although not gate-raiding). It may be a weak ship by itself, but it can to used to both kite and hunt down long-range vessels. 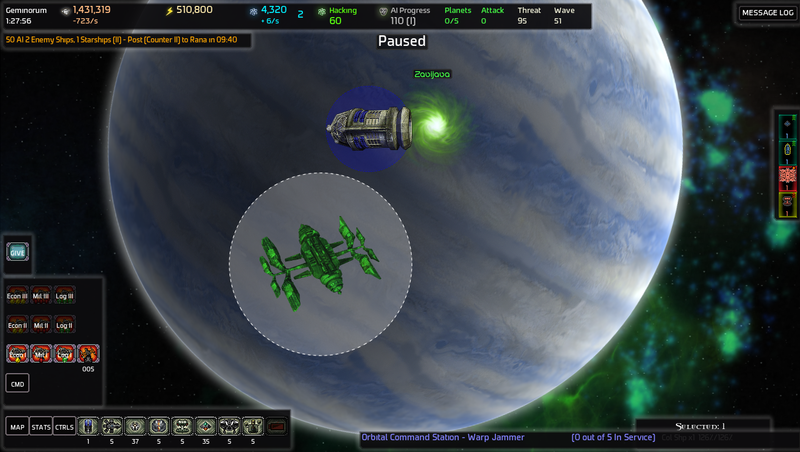 Raiders and Space Planes fill similar niches: the former can serve better as a general combat vessel, while the latter is more specialised (and possibly somewhat better overall). 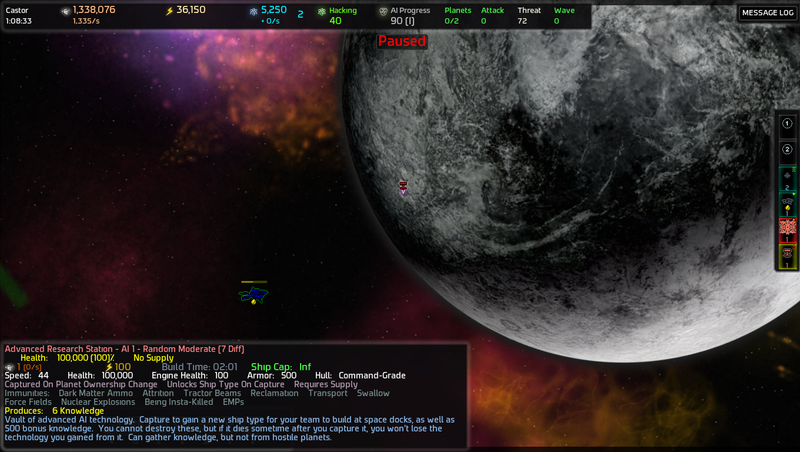 Defenses against an overwhelming number of these ships come down to effective Gravitational Turret placement. They are not strong individually, and will lose to both Fighters and Missile Frigates when caught. Really? These will serve me quite well then. I can has bulletproof fighters next? Adjust pacing of this LP! The early-game is over, so I'll focus less on detail and more on overall events. Zoom in more when taking screenshots. I don't comment on all AARs for lack of time, but I do generally pay attention This one is very entertaining. Suddenly, a wild beta patch appears! Quote from: AI War Beta 7.032-7.033 "Peaceful Interlude" Released! Ah sweet now I can actually set up multiple defensive lines! 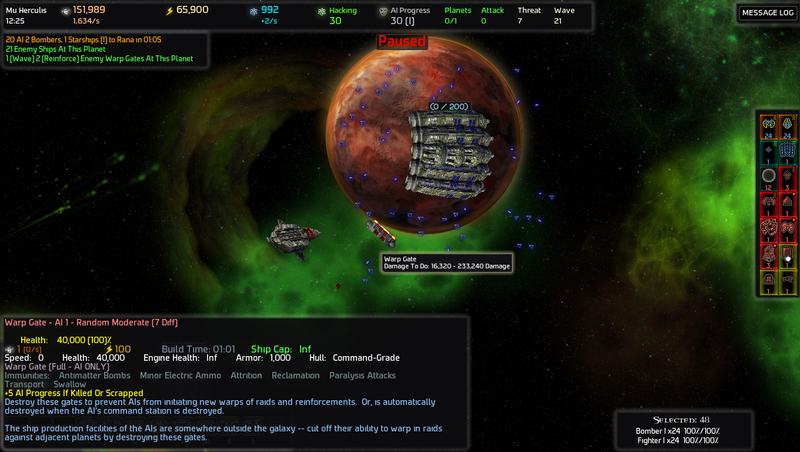 Also perhaps I should research Beam Turrets to see how they perform in comparison. Even more dakka! 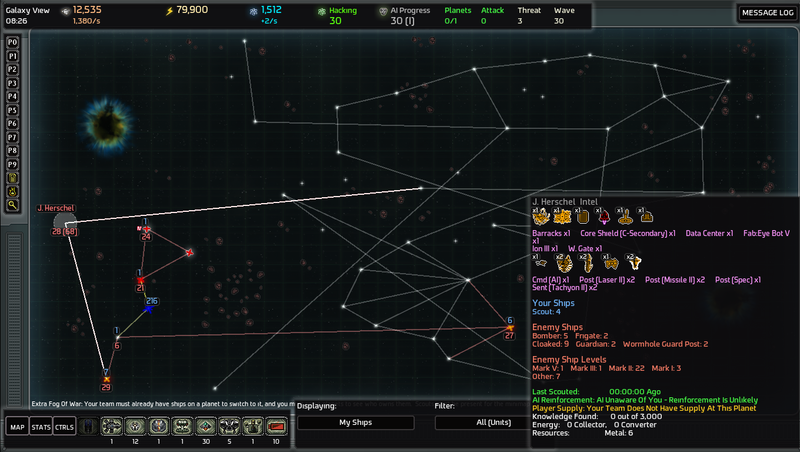 ...whoa, now I'm glad I didn't dump research into normal turrets quite yet. Dakka Dakka. Do tell me the MKI version wasn't nerfed? In case the audience was wondering why numbers are suddenly so low, since I plan on cross-posting this elsewhere. ...At least one I finish building the command stations and power plants at Castor and Zeta Lepons I won't have energy problems for a while. 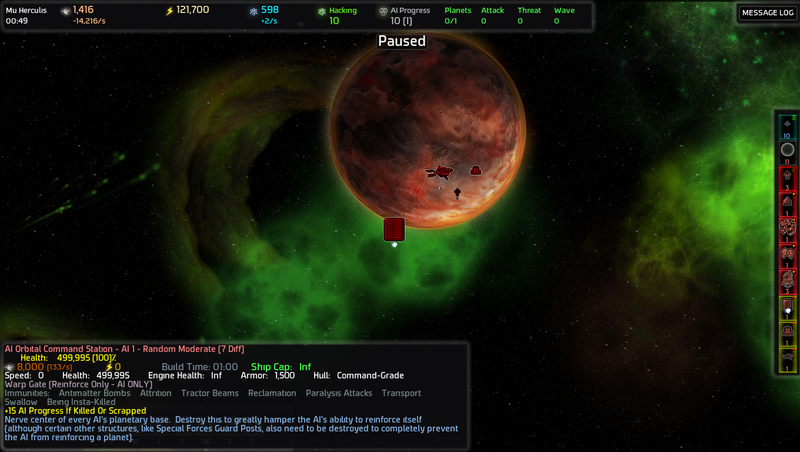 Also, with those two planets captured I can now actually damage the core shield generators in those systems. I can't be bothered to divert ships, so I'll just plop a single turret next to each of them, order it to start shooting, and wait an hour. 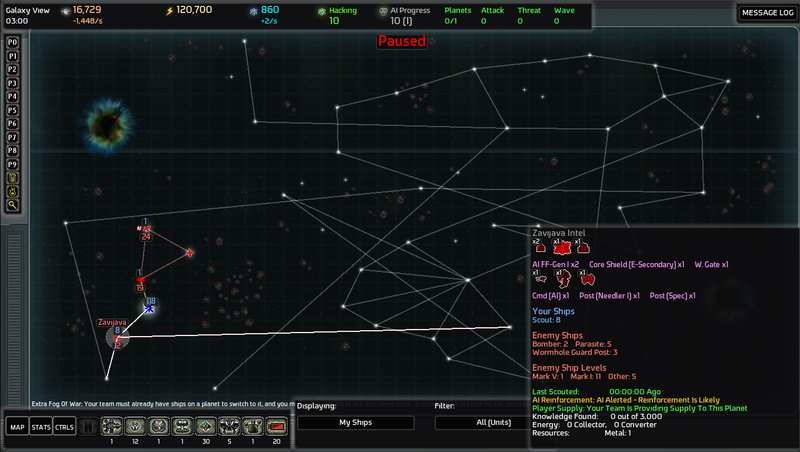 Group E-Secondary shield network destroyed. Group A-Prime shield network weakened. 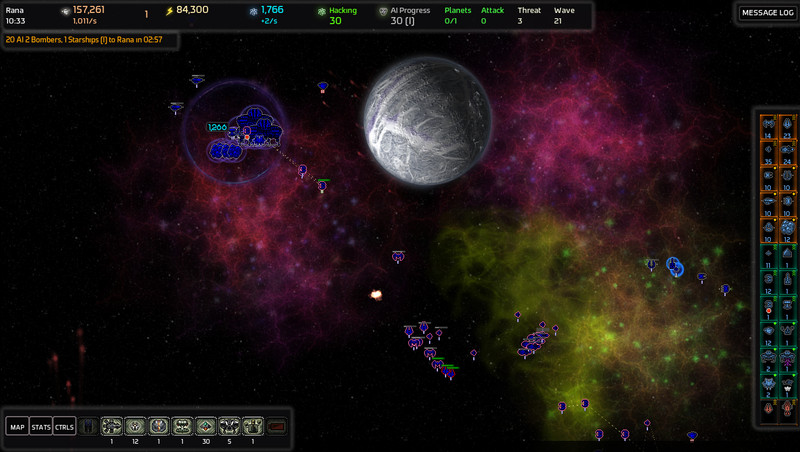 Meanwhile I suppose I should do somethig about the threat in Zavijava before it builds up further and the AI decides to attack me with 900 ships all at once. Half of the ships there are bombers, the other half are cloaked ships with light/ultralight hulls. 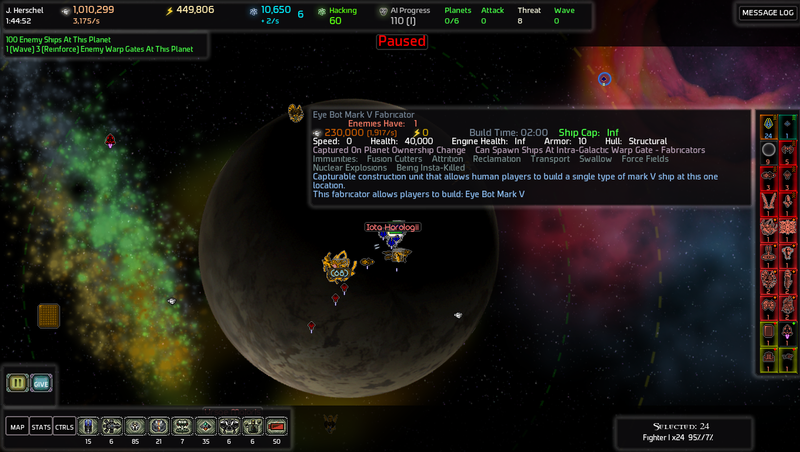 Naturally they are accomponied by two siege starships and one leech. 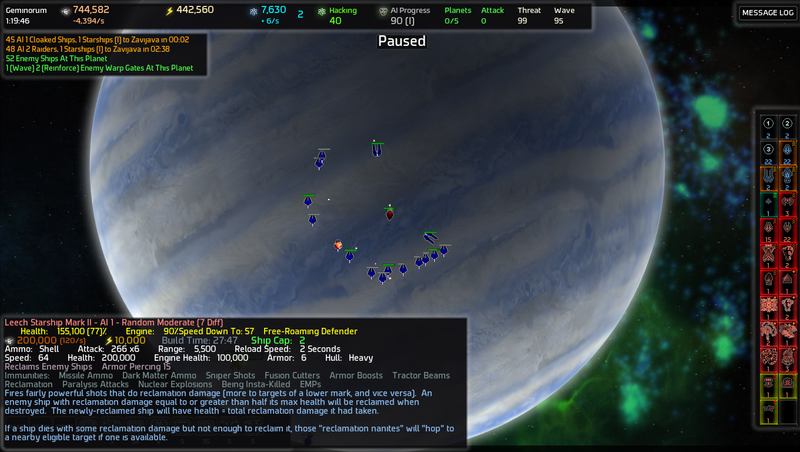 I could send my ships all in one big blob, but instead I'll use my micro-fighters and my macro-fighters to clear out the bombers first. In hindsight I could of sent my space tanks as well. I manage to clear out almost all the bombers, but then the leech starship gets within attack range and the AI fleet suddenly has 13 micro-fighters. Funny how that works. T minus 0:06 seconds. All hands, brace for impact! I won't suppose that all these space planes would be the attack wave would it? 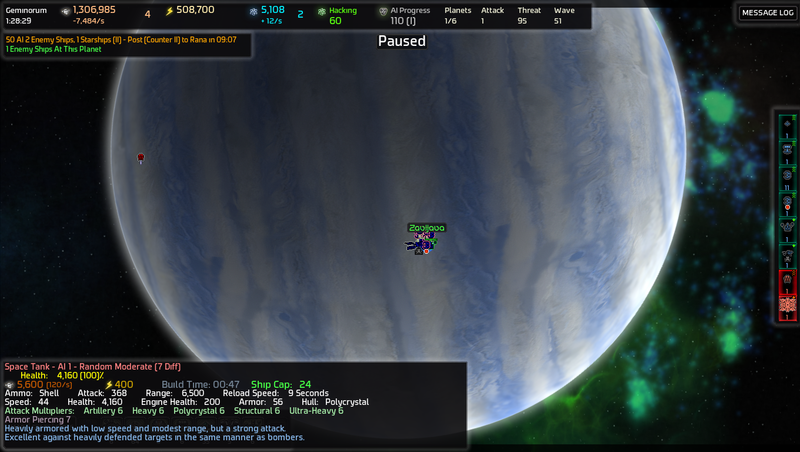 I kinda blew out their intended destination mid-warp, so they had to emerge from a different warp gate and fly to the wormhole across open space. And now they are all like "Hey Frank, didn't Bob go in there earlier but never came back out? How about we go somewhere else?" Well they can just stand around and mope all day, I want none of their drama unless it is the lamentation of their woman. 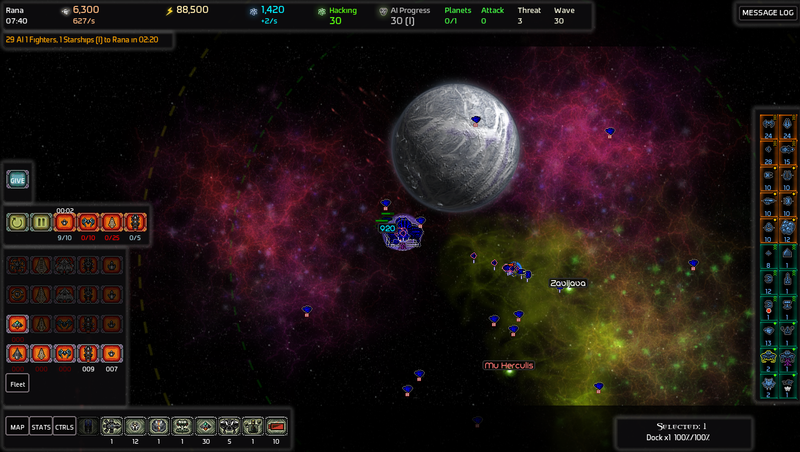 I got a planet to invade. 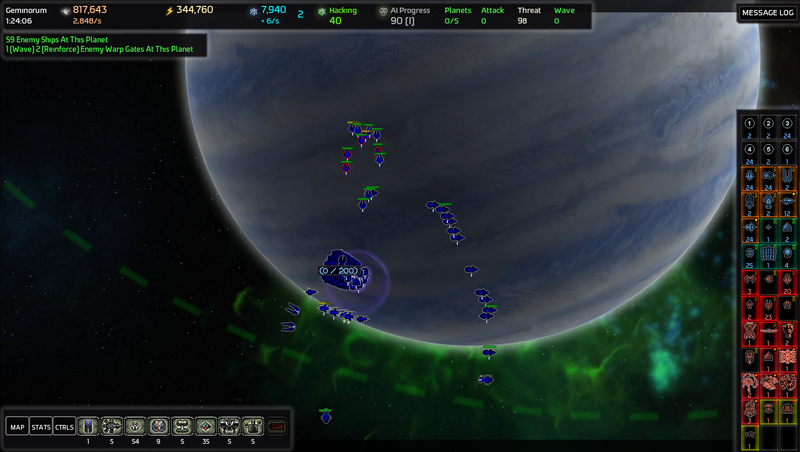 With those attack waves inbound and defenses still under construction, I decide against committing my whole fleet to the invasion. Instead I'll use only my bomber starships, siege starships, and fighters. Earlier on the bomber starships had little problem dealing with MKI stuff, but the MKII Leech Starship proves to be more difficult to take down. Also what's the point of the 15 armor piercing on that thing? 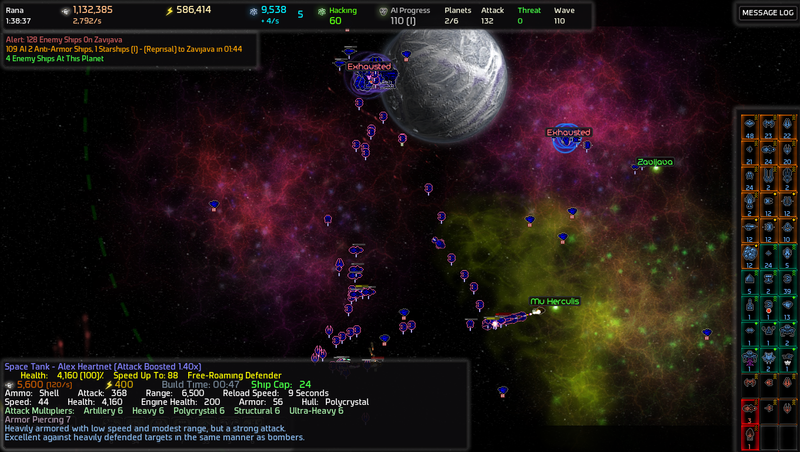 In response to the leech's death the AI sends an assortment of fleetships to defend the system. These must be the special forces. 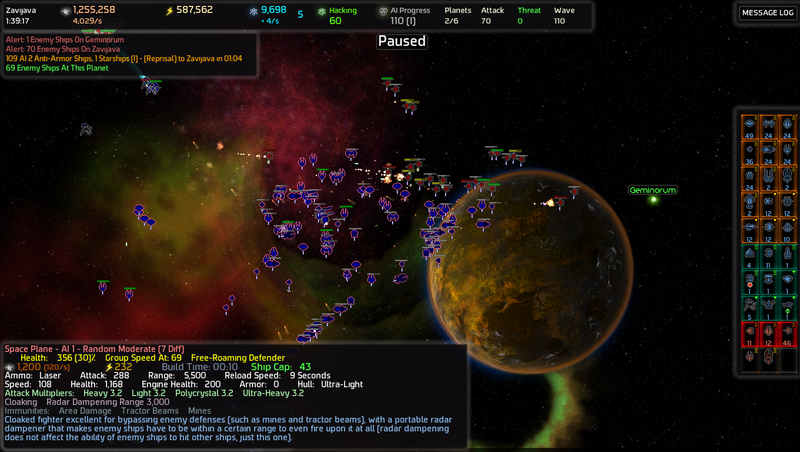 ...Followed by a large group of Riot Starships. Yay. ...I'm gonna leave now and come back with the rest of my fleet. I'll use the same sniper beachhead strategy again this time. 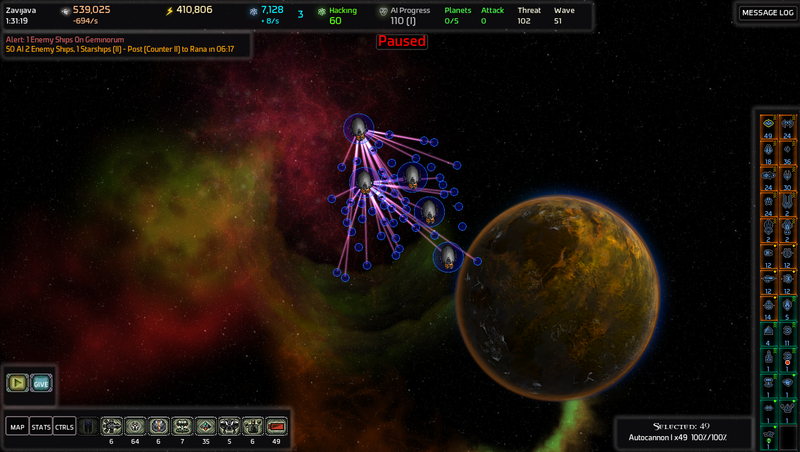 Pack all of my ships into transports as well as a few engineers and a mobile builder, move them to the edge of the gravity well, and build a full cap of 24 sniper turrets right behind a forcefield. Bah. Whatever I'll just work around the problem. Problem solved, at the expense of knowledge that I'd rather spend elsewhere. 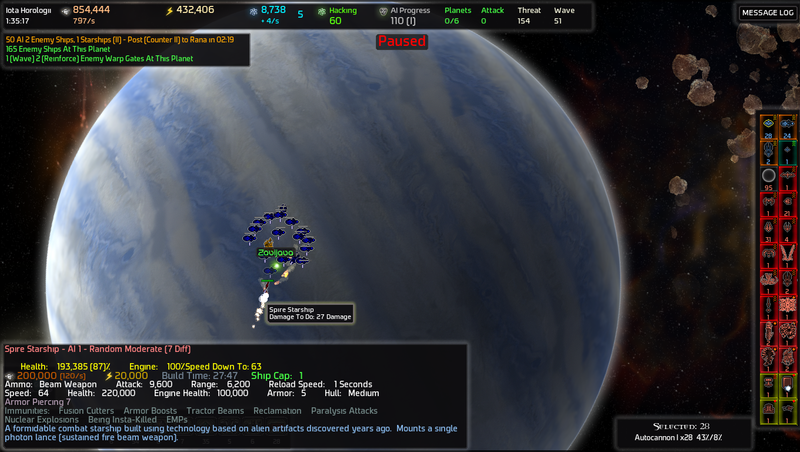 Barely had time to get my beachhead up and running before a riot starship decides to attack it. 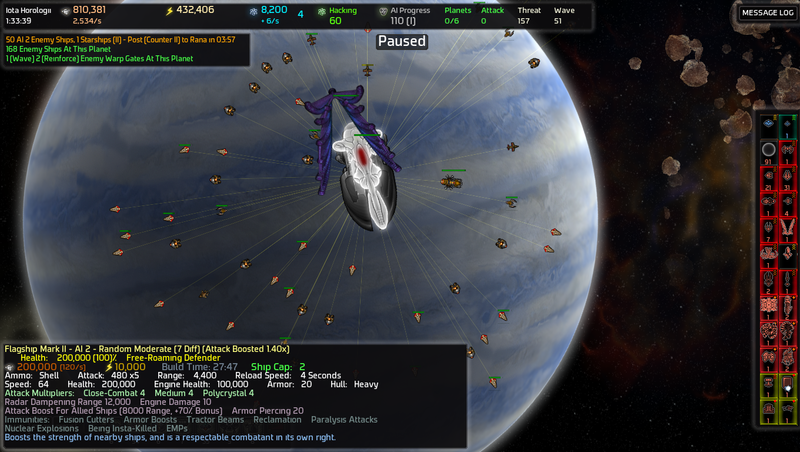 Bomber starships, kill it before it can reach my fleetships. 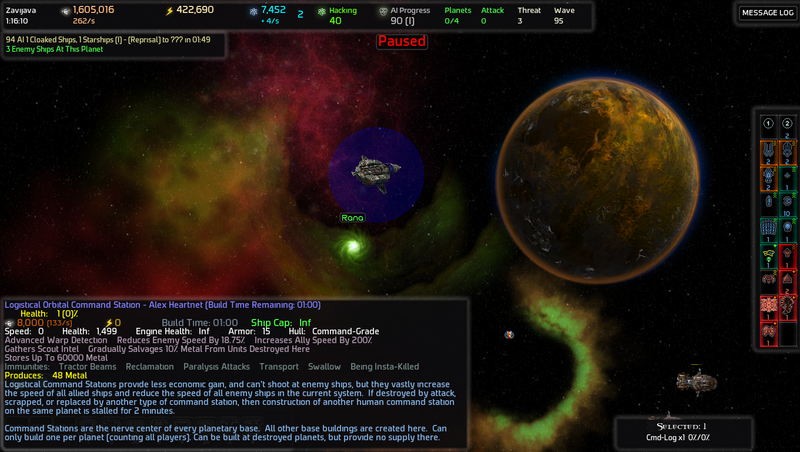 Oh...those won't be the same starships from 5 minutes ago, by any chance? This is going to be painful. At least if I can kill all of them now then I won't have to deal with them later. 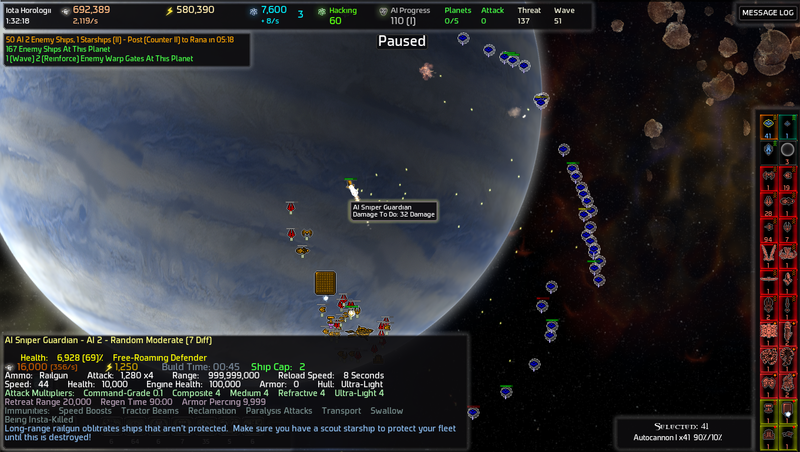 My starships on their own aren't doing enough damage. 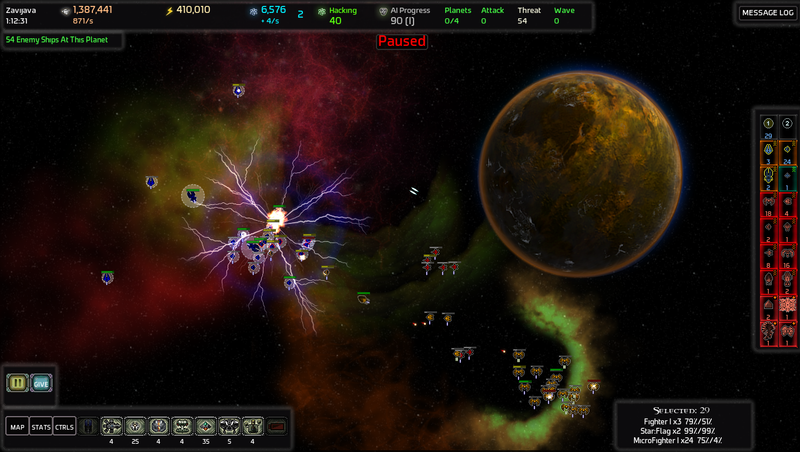 Ah forget it all fleetships concentrate fire and brace for incoming ordiance! ...Are they all dead? Good. In the exchange I lost umm...no ships at all?!? Wut how I don't even meh engineers fix the damage and everyone go attack. 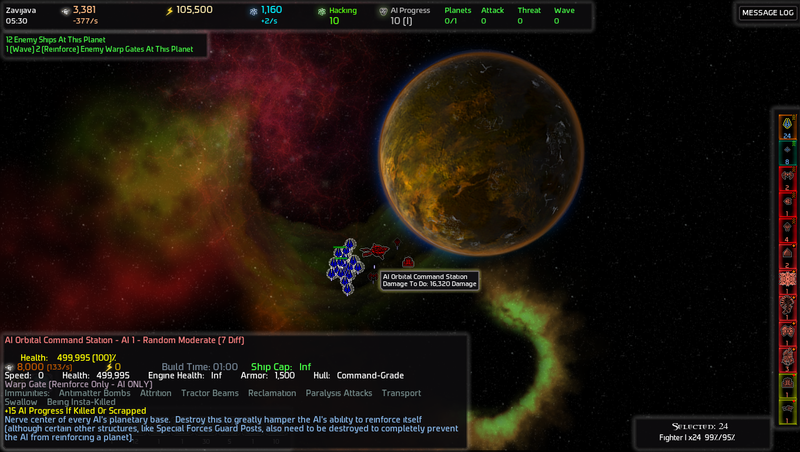 This system is as good as mine, so I might as well just assassinate the command station. Waitaminute. I thought these things were removed from the game? Huh. Well I've never actually fought one of them before, so this will be interesting. Well, there goes all my science. Le sigh. 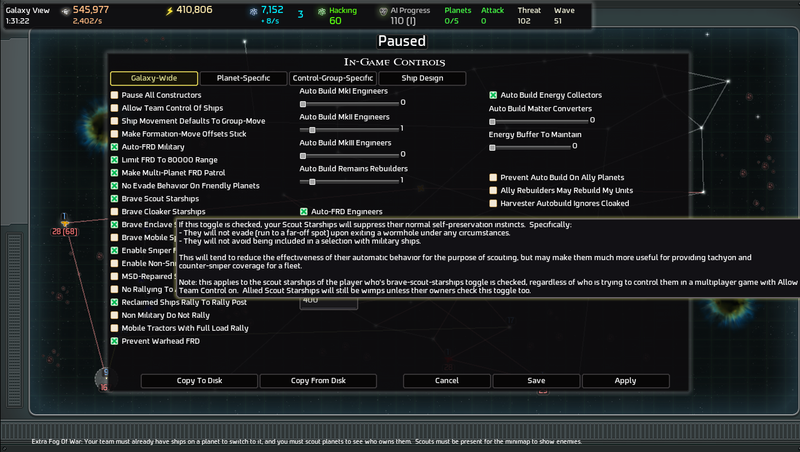 So if I am reading this right, the AI won't be alerted by the warp jammer itself but will still go on alert if you have a bunch of military ships in the area? The planet had an ARS, meaning I get a new toy when I took the system. ...Autocannons? I cannot say that I have ever used these things before, and I have no idea how to. Wow, these suit my purposes nicely. 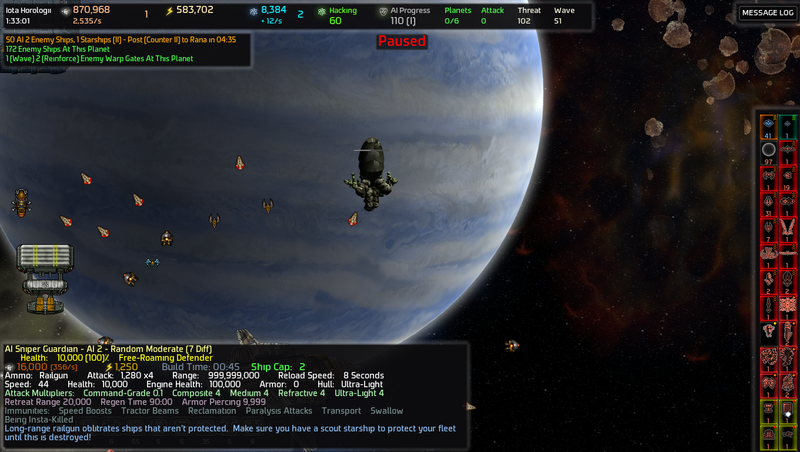 With the warp jammer built and in place, there umm shouldn't be a lone AI space tank attacking me? 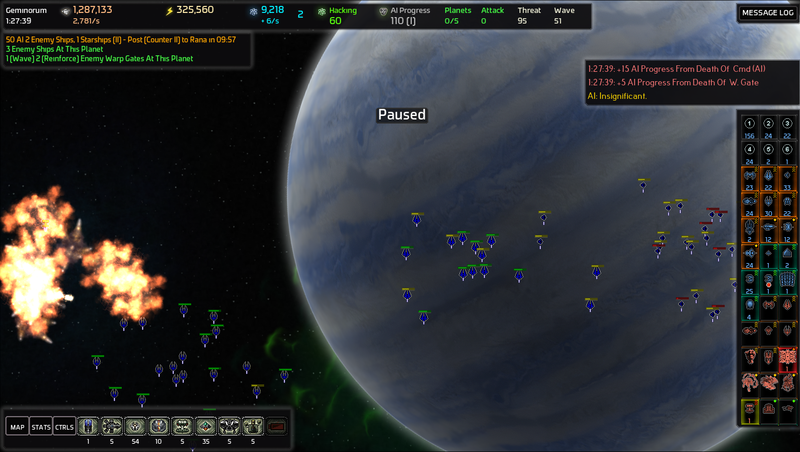 And I can't bring in my fleet to kill it because that would put the AI back on alert and it'll send more space tanks to attack me. I'm guessing that the AI probably saw a lone undefended human civilian ship (my colony ship) and decided that since it was undefended, it'd only take one ship to destroy it. 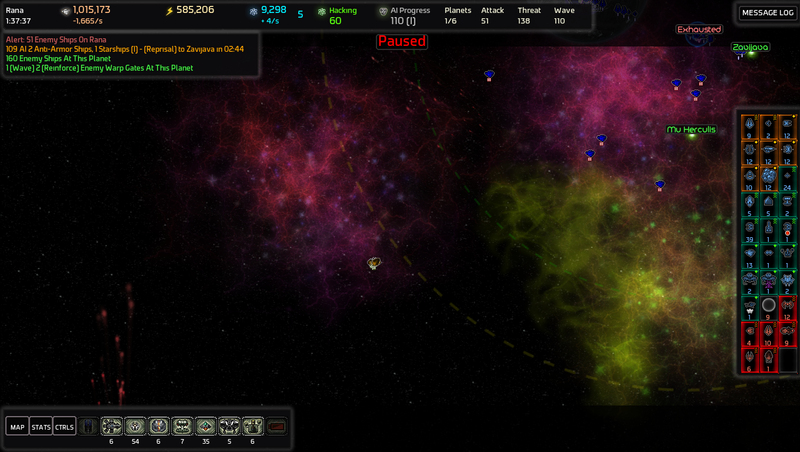 Bringing in my fleet would defeat the point of the warp jammer, but I need to kill this thing. 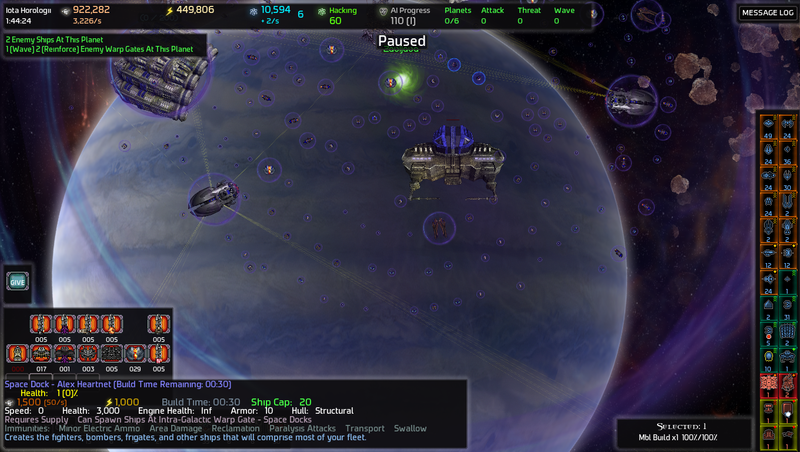 Laser turrets get bounses against polycrystal hulls, and if I build just one hopefully that won't put the planets on alert? Thankfully the answer is no. The AI hivemind at large still remains blissfully unaware of my presence. However, these warp jammers are impressively squishy, and the tank manages to take out half of the jammer's health with a single shot before dying. 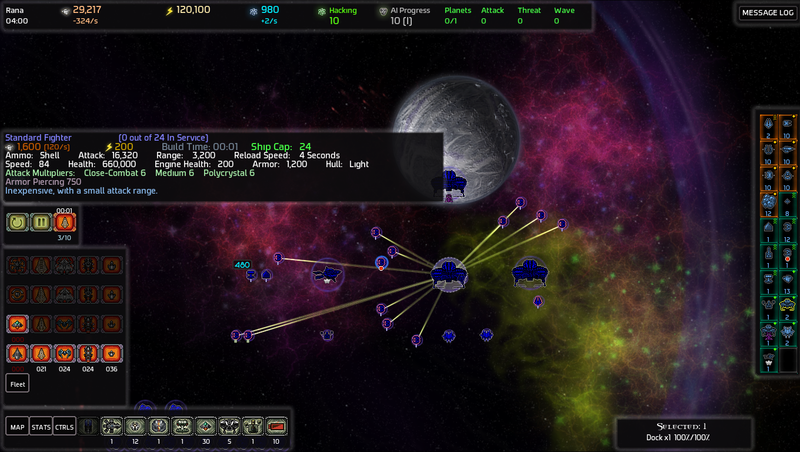 With all of my resource buildings set up and the planet being guarded by an entire laser turret, the AI still remains oblivious to my presence in the system and will launch its attacks from a different direction. Hopefully. Maybe. We'll all going to die, aren't we? AFAIK the warp jammer station also protects your fleet from alerting the adjacent planet. 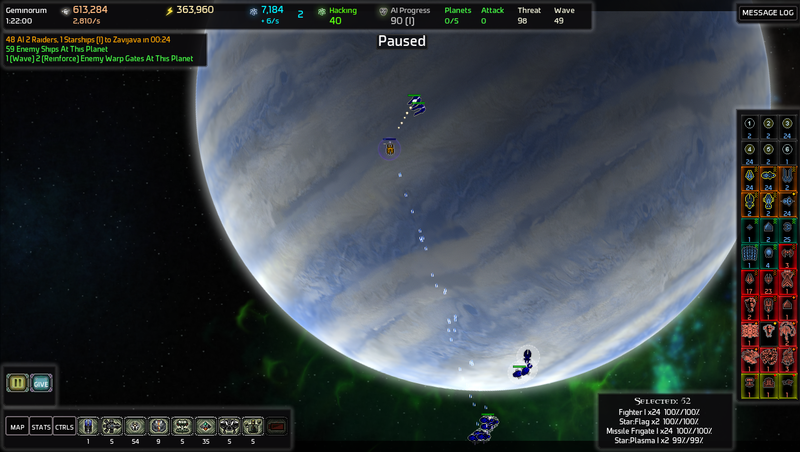 In one of your earlier screenshots you wrote that you shouldn't colonize a planet to not set adjacent planets on alert. 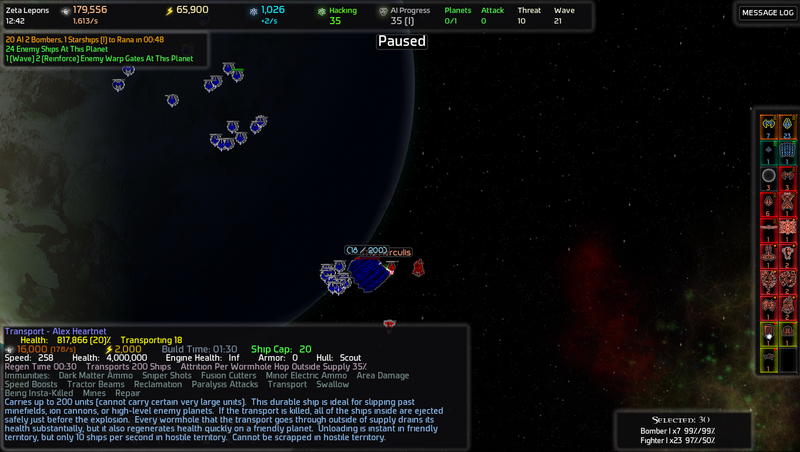 They are on alert as soon as you blow up the AI command station. It doesn't matter if you colonize it or not. The Writer's Block is a horrific creature feared by bards and poets alike. To the uninitiated, it may look like a simple brick, but do not be fooled by its granite exterior. What lies beneath is a terrible entity capable of destroying all of creation. 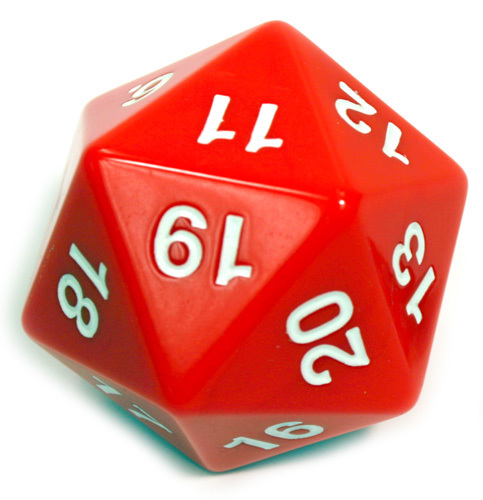 I roll a skill check to defeat the Block! Writer's Block is defeated! You earn 1,200 xp. That's one threat to the universe down, only 29,403,503,902 remaining. As much as I love sniper turrets, I doubt I would enjoy being on the receiving end. How in the galaxy am I supposed to deal with these things? How, indeed. Prepare the autocannons! ...Somehow I don't think Autocannons are meant to be used as sneak attack assassins. They certainly take a while to kill stuff on their own, but they were able to manage the task I gave them. MKII Flagship. Hmm. Sounds like a good idea, I might have to research it. Perhaps I should do something about this Spire Wannabe before it becomes a problem. My frigates aren't doing enough damage. I guess I'll use my entire fleet to kill it. Gotta love it when a plan meets the enemy. 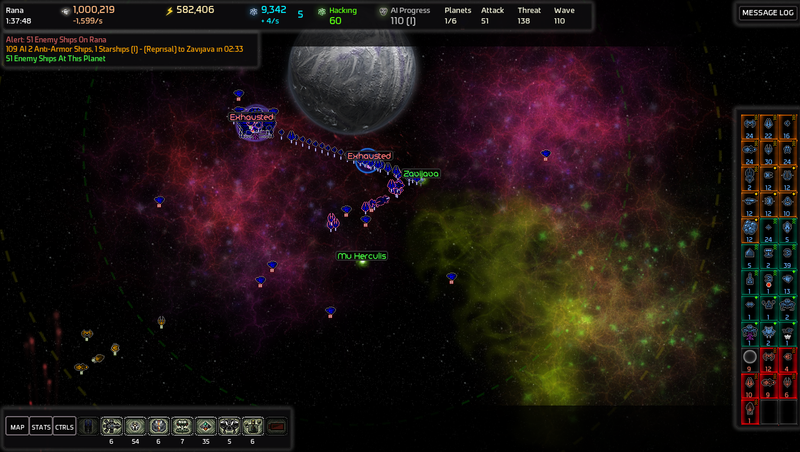 In preparation for the counterattack I will move my entire fleet on top of the wormhole. And here comes the attack wave! You robots were supposed to come out of the wormhole! Y'know, where I actually have my defenses set up to murder you! 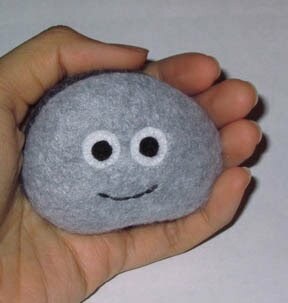 Now I understand why people hate these things. Good grief. 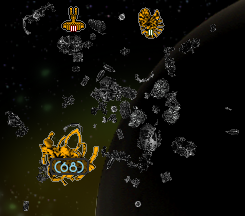 My plans for conquest are now delayed for 2 whole minutes while my ships deal with these things. How annoying. But it turns out the Block was also a counterattack post! ]But it turns out the Block was also a counterattack post! I hire a group of adventurers to fight off the counterattack so I don't have to. Blargh. Today has been a very bad day for me in every game I have touched. I better not have my command station blown up by supercharged creepers riding cave spiders or any such nonsense. Let's go storm evil robot death fortresses instead! It'll probably be more exciting then silly oversized lego-wannabe houses. 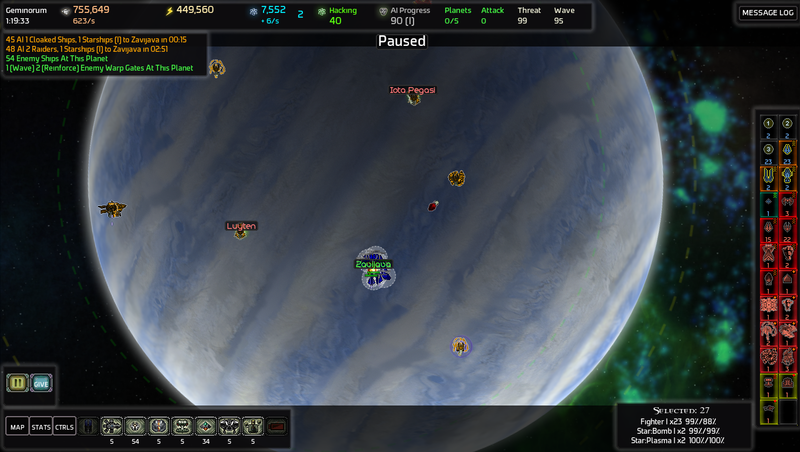 Instead of making a beeline for my command station, the space planes instead head for the Geminorum system. The system where I have the warp jammer set up. Stop them! Before they reach the jammer! Whew, close call. But I am safe. Now it is time to take the fight to the enemy! No, bad robots, very bad. At least this wave is much weaker then the last. I have frigates at my disposal! I win! 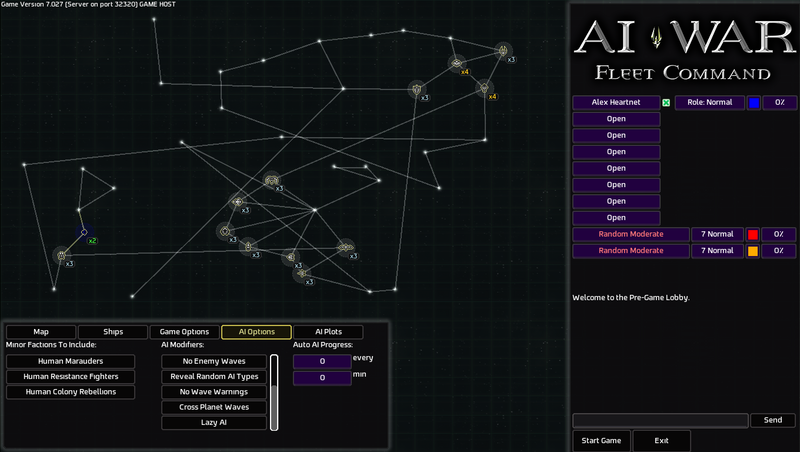 And now it is time to turtle my way into AI-controlled territory! I can already tell that this system will be fun to take. At least taking it will be worthwhile. Tasty! Don't mind if I do. Commence operation "Send Scouts Everywhere And Get Them All Killed!" I'm afraid to look at the scouting report now.